Threatened by nutritional deficiencies. 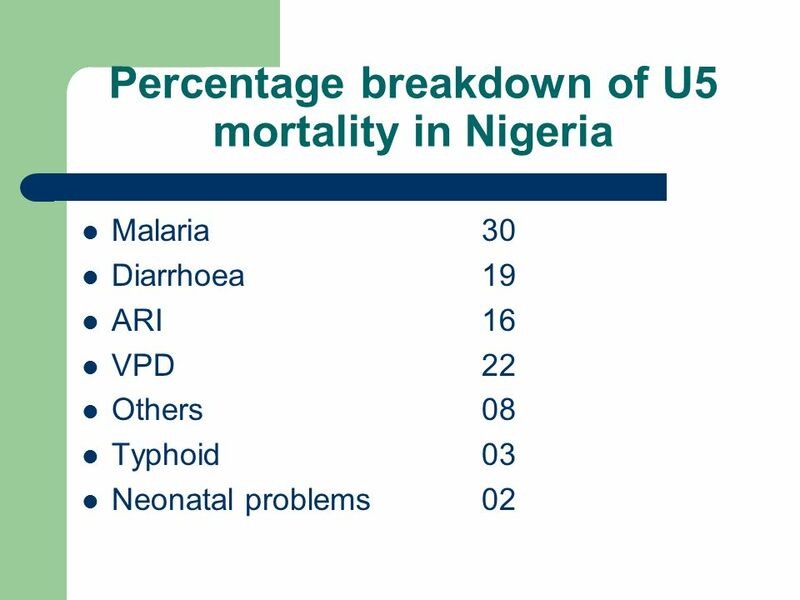 Illnesses- malaria, diarrhoea, VPD, ARI esp pneumonia High maternal morbidity and mortality. 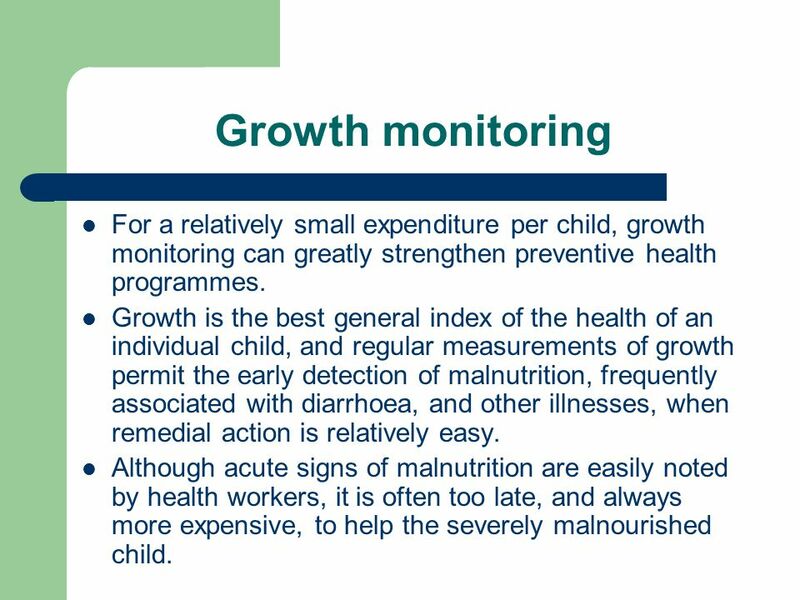 13 Growth monitoring For a relatively small expenditure per child, growth monitoring can greatly strengthen preventive health programmes. 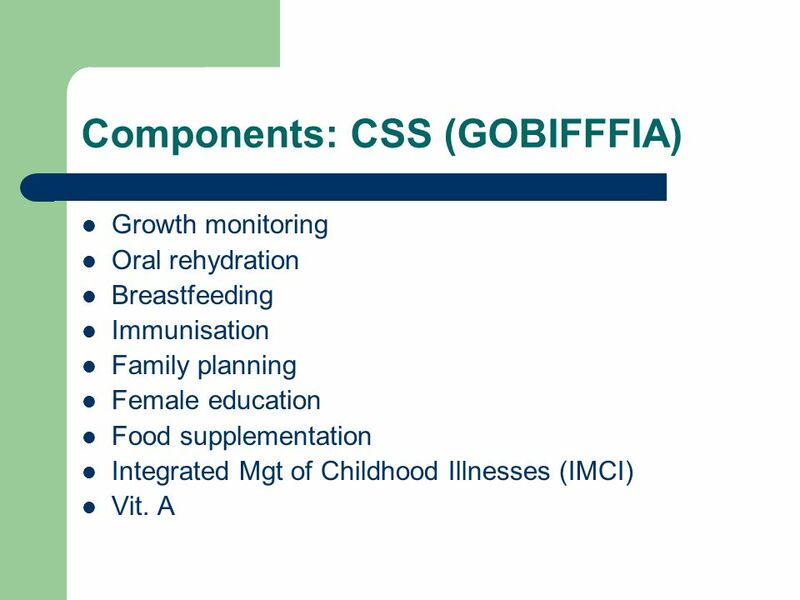 Growth is the best general index of the health of an individual child, and regular measurements of growth permit the early detection of malnutrition, frequently associated with diarrhoea, and other illnesses, when remedial action is relatively easy. Although acute signs of malnutrition are easily noted by health workers, it is often too late, and always more expensive, to help the severely malnourished child. 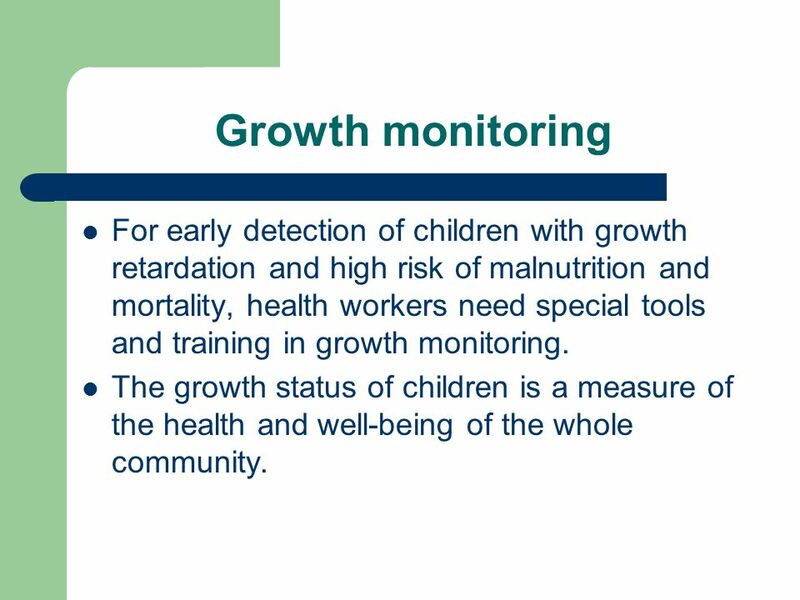 14 Growth monitoring For early detection of children with growth retardation and high risk of malnutrition and mortality, health workers need special tools and training in growth monitoring. The growth status of children is a measure of the health and well-being of the whole community. what equipment is required? who will use the equipment and where? what will be done with the results? what is the objective? 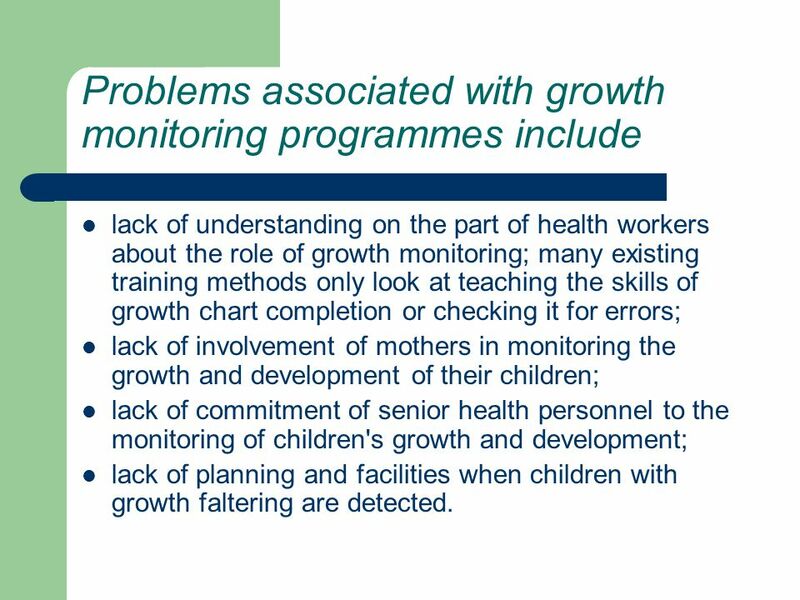 lack of understanding on the part of health workers about the role of growth monitoring; many existing training methods only look at teaching the skills of growth chart completion or checking it for errors; lack of involvement of mothers in monitoring the growth and development of their children; lack of commitment of senior health personnel to the monitoring of children's growth and development; lack of planning and facilities when children with growth faltering are detected. 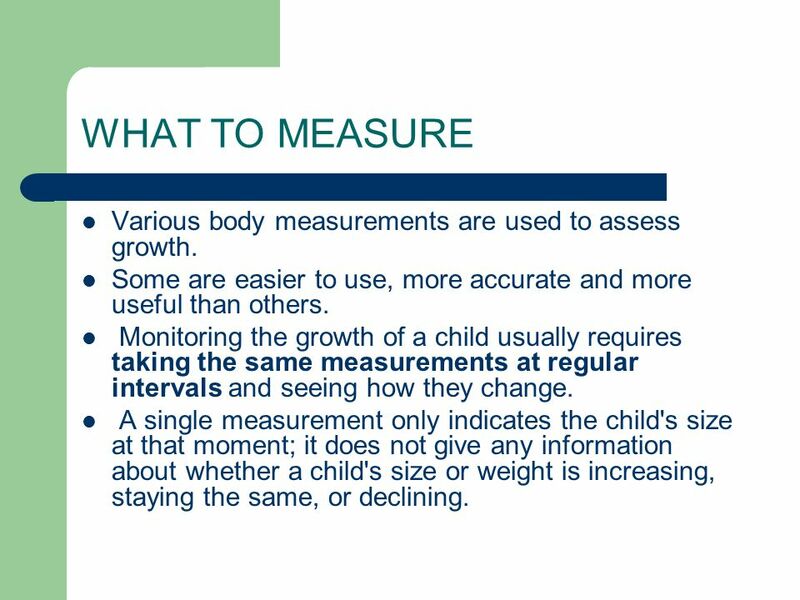 17 WHAT TO MEASURE Various body measurements are used to assess growth. Some are easier to use, more accurate and more useful than others. 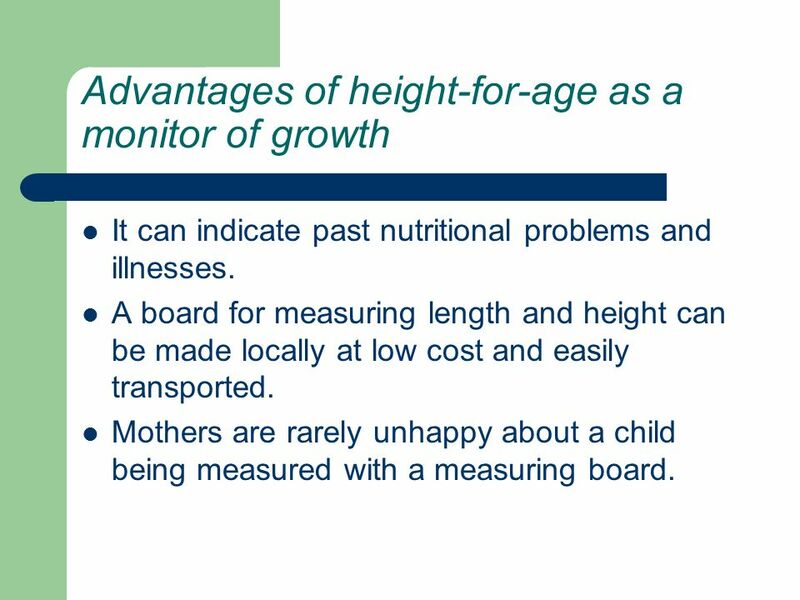 Monitoring the growth of a child usually requires taking the same measurements at regular intervals and seeing how they change. A single measurement only indicates the child's size at that moment; it does not give any information about whether a child's size or weight is increasing, staying the same, or declining. 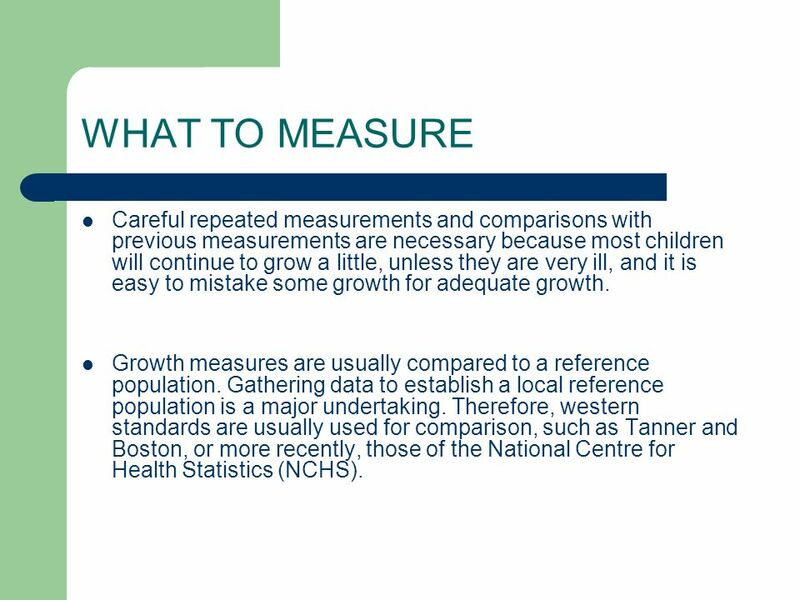 18 WHAT TO MEASURE Careful repeated measurements and comparisons with previous measurements are necessary because most children will continue to grow a little, unless they are very ill, and it is easy to mistake some growth for adequate growth. Growth measures are usually compared to a reference population. Gathering data to establish a local reference population is a major undertaking. 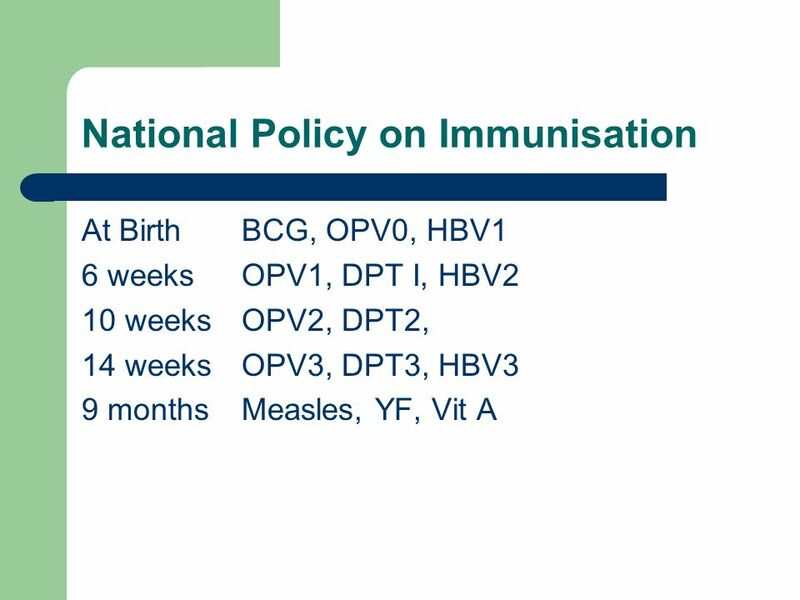 Therefore, western standards are usually used for comparison, such as Tanner and Boston, or more recently, those of the National Centre for Health Statistics (NCHS). 19 Weight-for-age To obtain weight-for-age, the weight of the child (in kgs) is compared with that of a healthy normal child of the same age from a reference population. 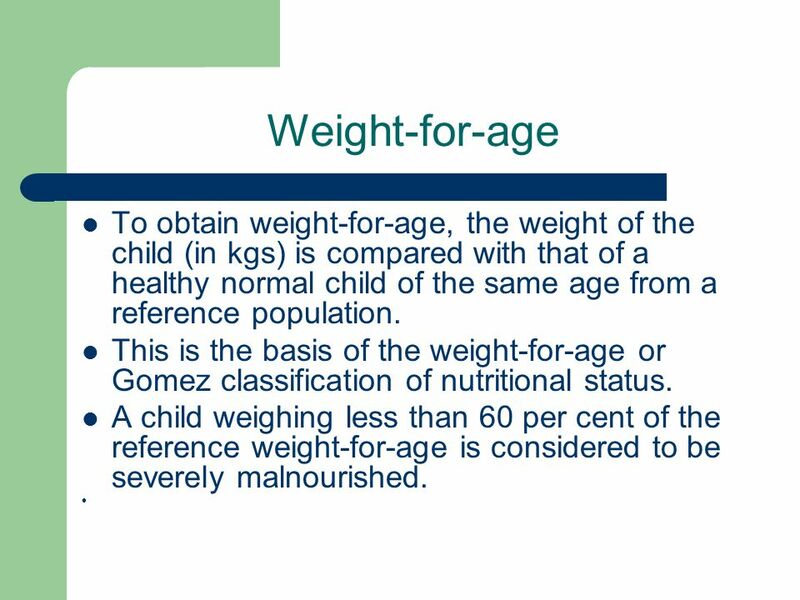 This is the basis of the weight-for-age or Gomez classification of nutritional status. 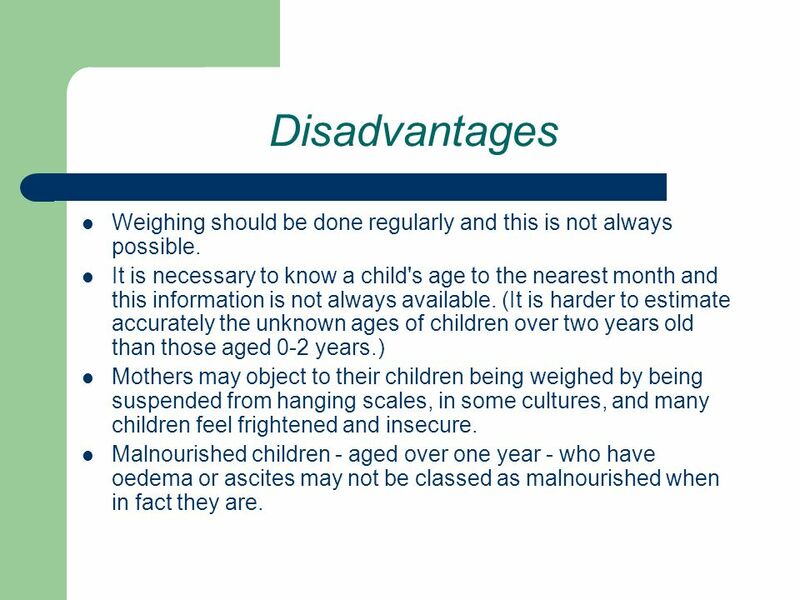 A child weighing less than 60 per cent of the reference weight-for-age is considered to be severely malnourished. 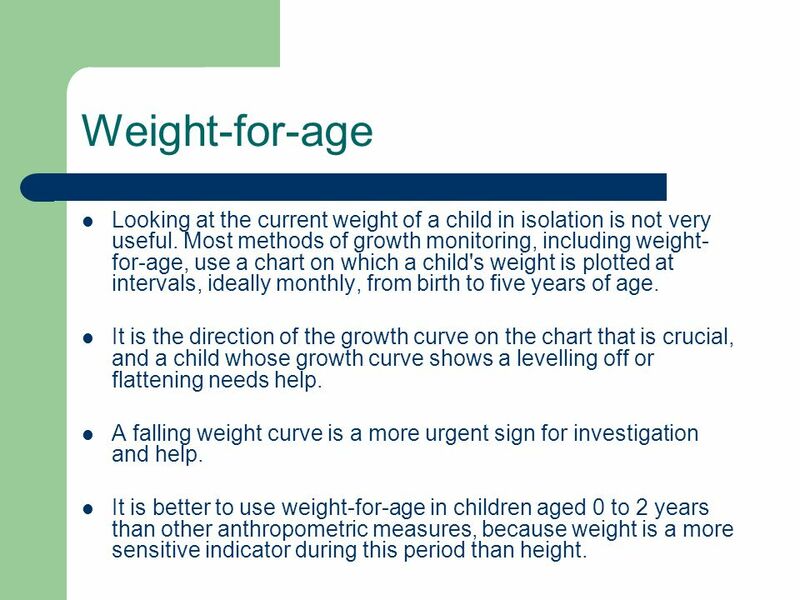 20 Weight-for-age Looking at the current weight of a child in isolation is not very useful. 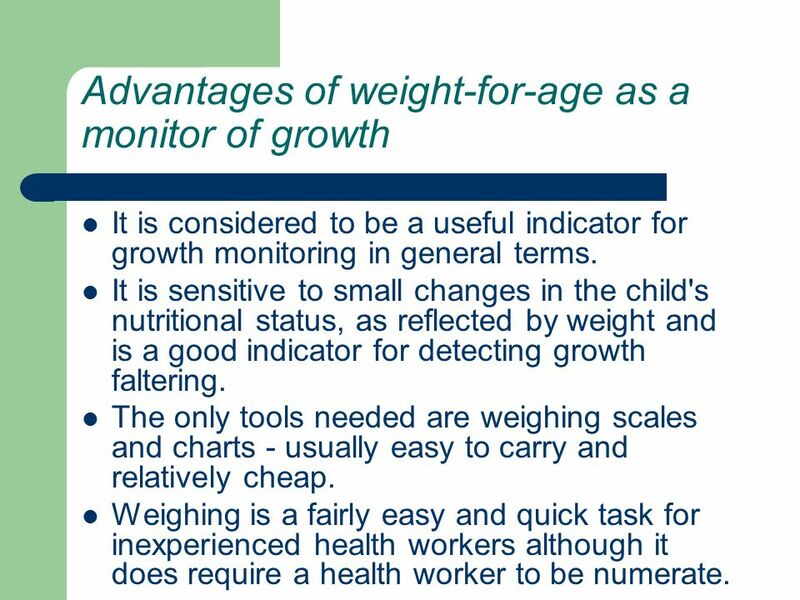 Most methods of growth monitoring, including weight-for-age, use a chart on which a child's weight is plotted at intervals, ideally monthly, from birth to five years of age. It is the direction of the growth curve on the chart that is crucial, and a child whose growth curve shows a levelling off or flattening needs help. A falling weight curve is a more urgent sign for investigation and help. It is better to use weight-for-age in children aged 0 to 2 years than other anthropometric measures, because weight is a more sensitive indicator during this period than height. 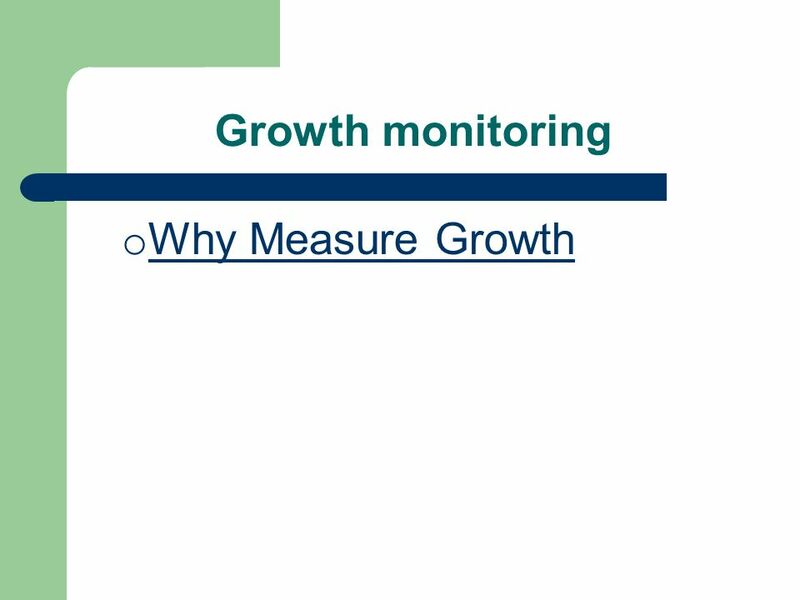 It is considered to be a useful indicator for growth monitoring in general terms. It is sensitive to small changes in the child's nutritional status, as reflected by weight and is a good indicator for detecting growth faltering. The only tools needed are weighing scales and charts - usually easy to carry and relatively cheap. Weighing is a fairly easy and quick task for inexperienced health workers although it does require a health worker to be numerate. 22 Disadvantages Weighing should be done regularly and this is not always possible. It is necessary to know a child's age to the nearest month and this information is not always available. 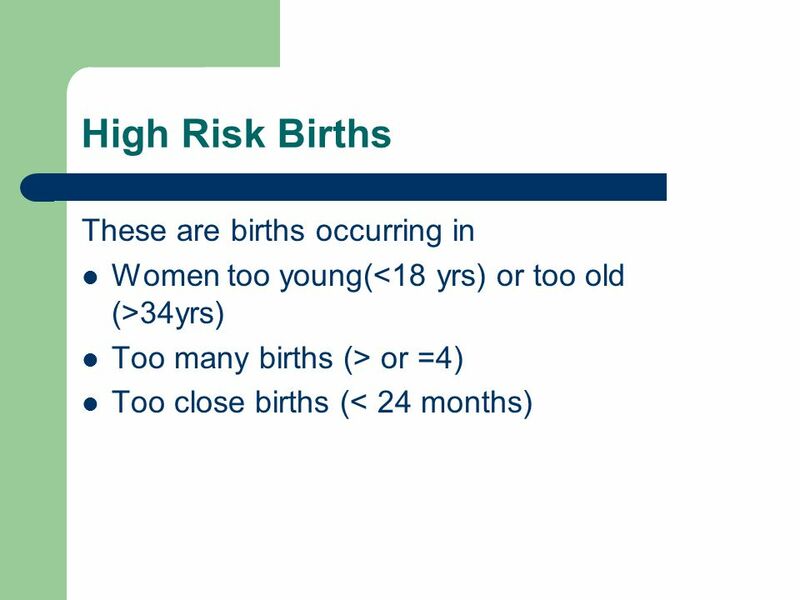 (It is harder to estimate accurately the unknown ages of children over two years old than those aged 0-2 years.) Mothers may object to their children being weighed by being suspended from hanging scales, in some cultures, and many children feel frightened and insecure. 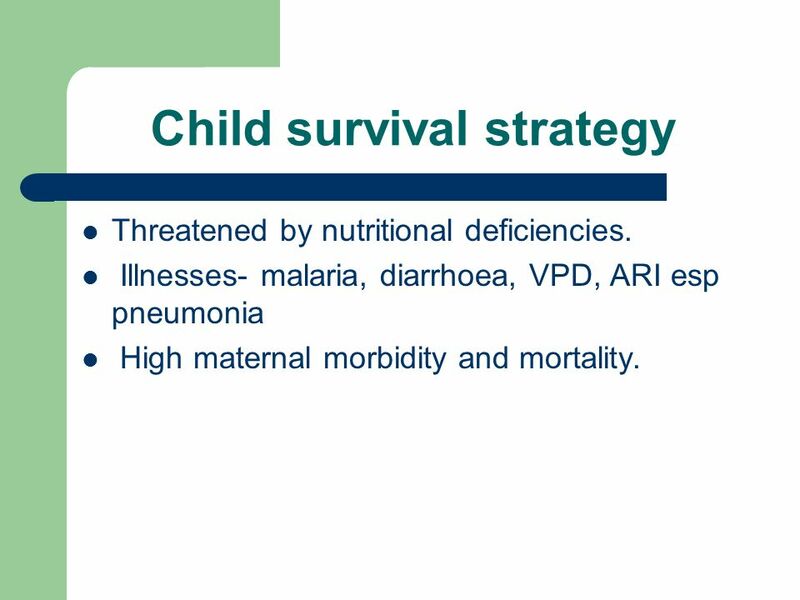 Malnourished children - aged over one year - who have oedema or ascites may not be classed as malnourished when in fact they are. Useful indicator where a child's age is unknown, or cannot be accurately determined, or where it is not possible to weigh a child repeatedly over a period of time. 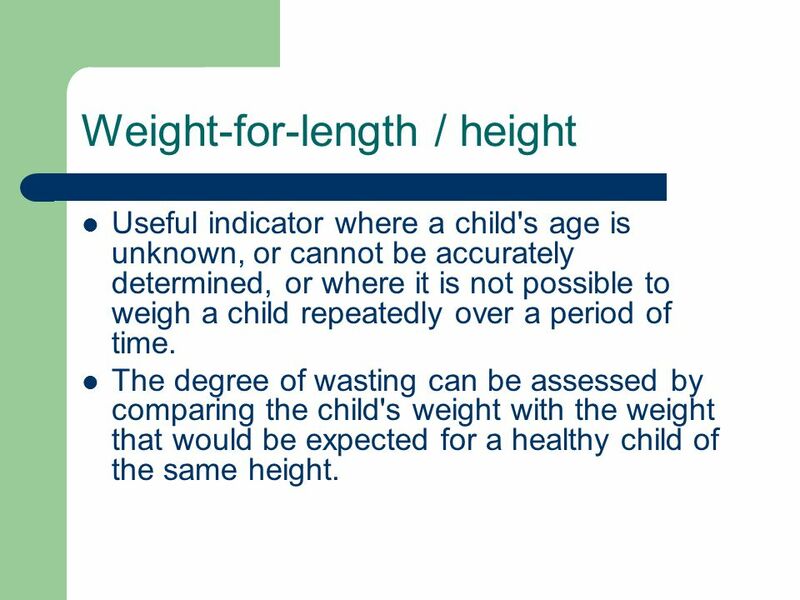 The degree of wasting can be assessed by comparing the child's weight with the weight that would be expected for a healthy child of the same height. 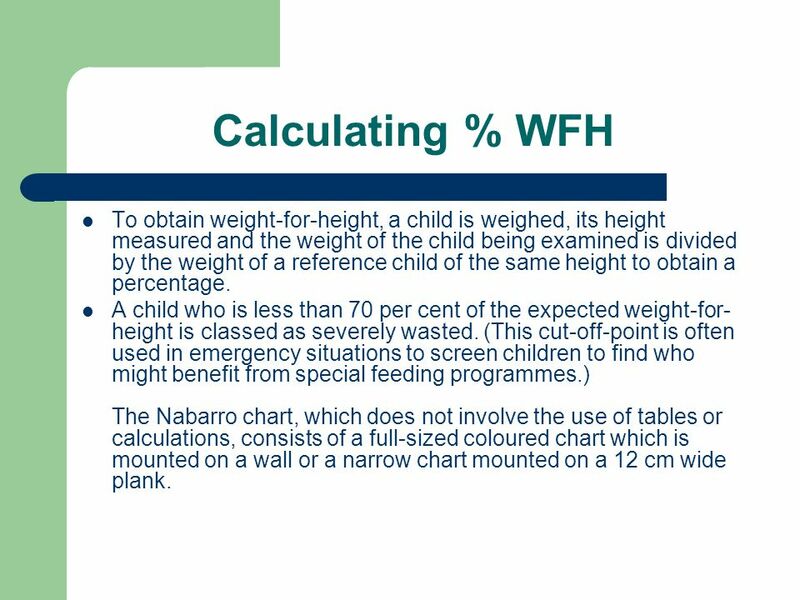 24 Calculating % WFH To obtain weight-for-height, a child is weighed, its height measured and the weight of the child being examined is divided by the weight of a reference child of the same height to obtain a percentage. A child who is less than 70 per cent of the expected weight-for-height is classed as severely wasted. (This cut-off-point is often used in emergency situations to screen children to find who might benefit from special feeding programmes.) The Nabarro chart, which does not involve the use of tables or calculations, consists of a full-sized coloured chart which is mounted on a wall or a narrow chart mounted on a 12 cm wide plank. It identifies the very thin or wasted child with definite malnutrition who requires immediate attention. It is a good indicator to distinguish children who are well-proportioned from those who are thin for their height. 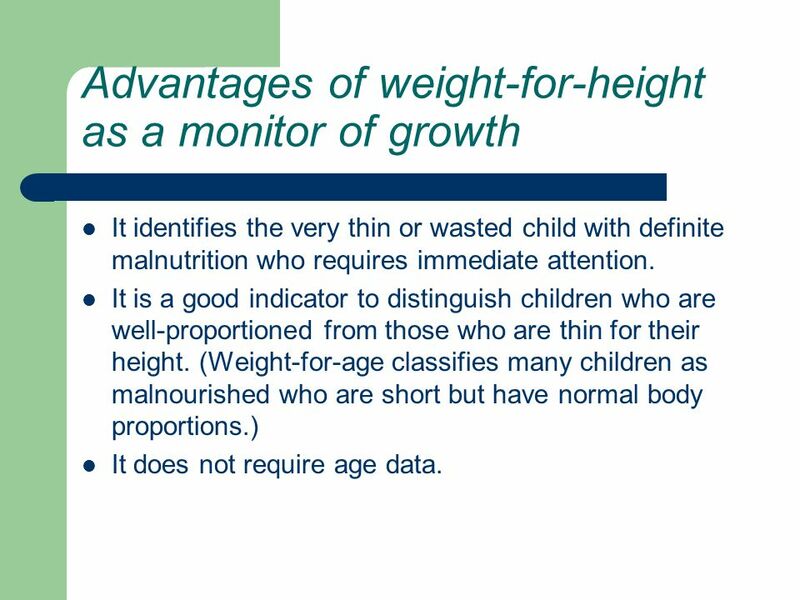 (Weight-for-age classifies many children as malnourished who are short but have normal body proportions.) It does not require age data. 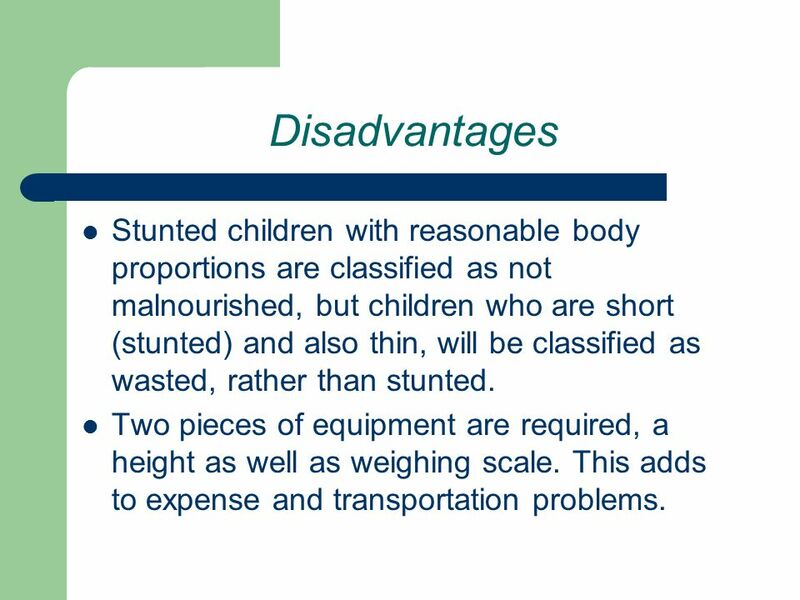 26 Disadvantages Stunted children with reasonable body proportions are classified as not malnourished, but children who are short (stunted) and also thin, will be classified as wasted, rather than stunted. Two pieces of equipment are required, a height as well as weighing scale. This adds to expense and transportation problems. Taking two measures takes longer, and this is a problem for the busy health worker, more training is also required and there is more chance of error. Some mothers may be reluctant to have their children weighed. Measuring height or length requires two people. 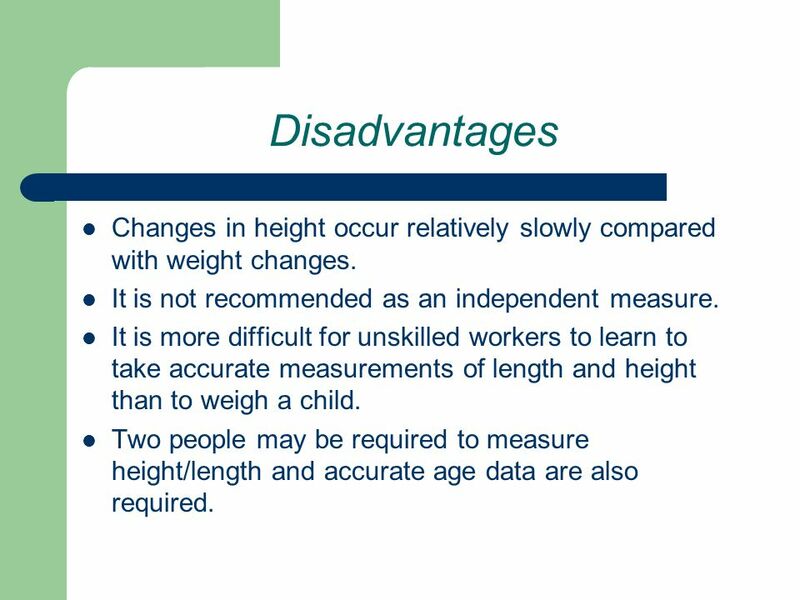 It is more difficult for unskilled workers to learn to take accurate measurements of length and height than to weigh a child. 28 Height-for-age Height-for-age compares a child's height with the expected height for a healthy reference child of the same age. 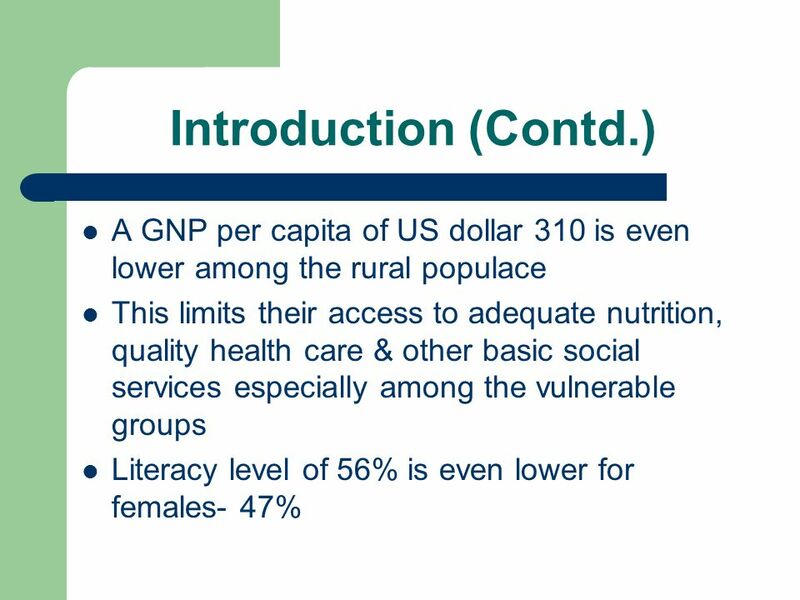 The measure can be used to assess stunting, which may be an index of long-term nutritional deprivation. 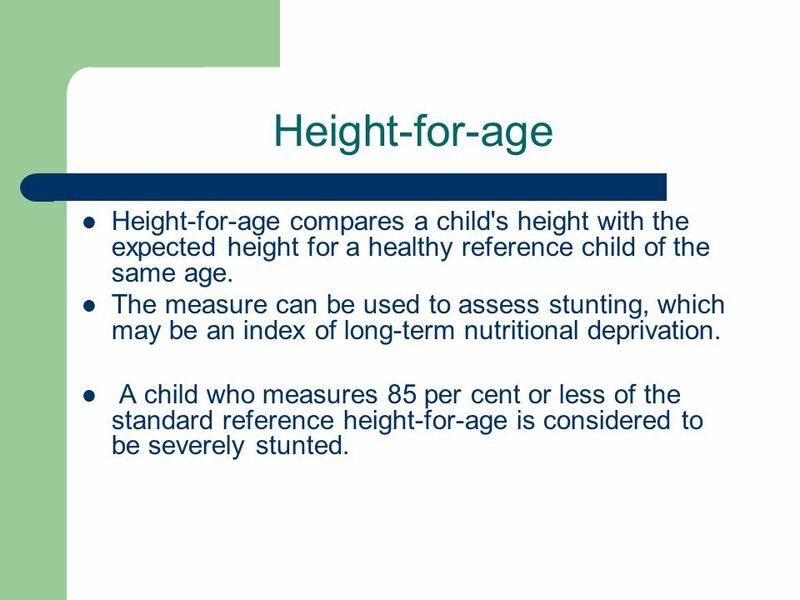 A child who measures 85 per cent or less of the standard reference height-for-age is considered to be severely stunted. It can indicate past nutritional problems and illnesses. A board for measuring length and height can be made locally at low cost and easily transported. Mothers are rarely unhappy about a child being measured with a measuring board. 30 Disadvantages Changes in height occur relatively slowly compared with weight changes. It is not recommended as an independent measure. 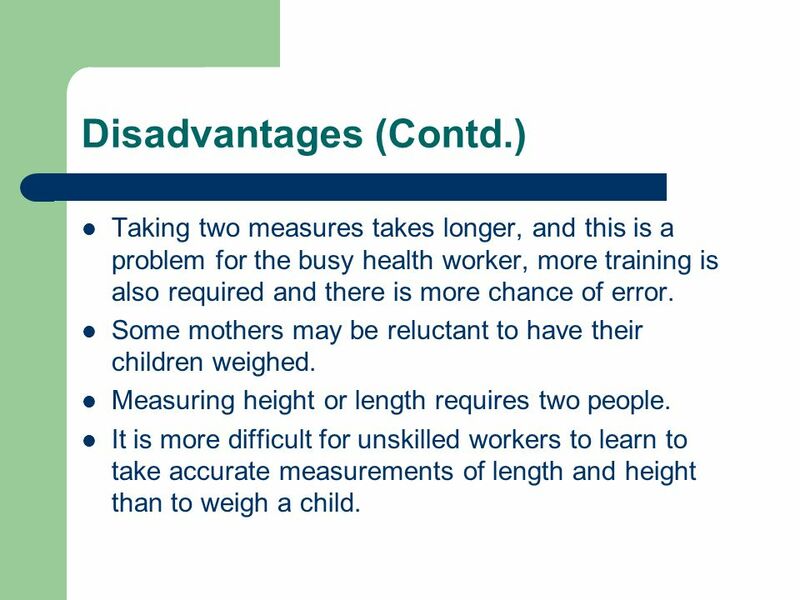 It is more difficult for unskilled workers to learn to take accurate measurements of length and height than to weigh a child. Two people may be required to measure height/length and accurate age data are also required. 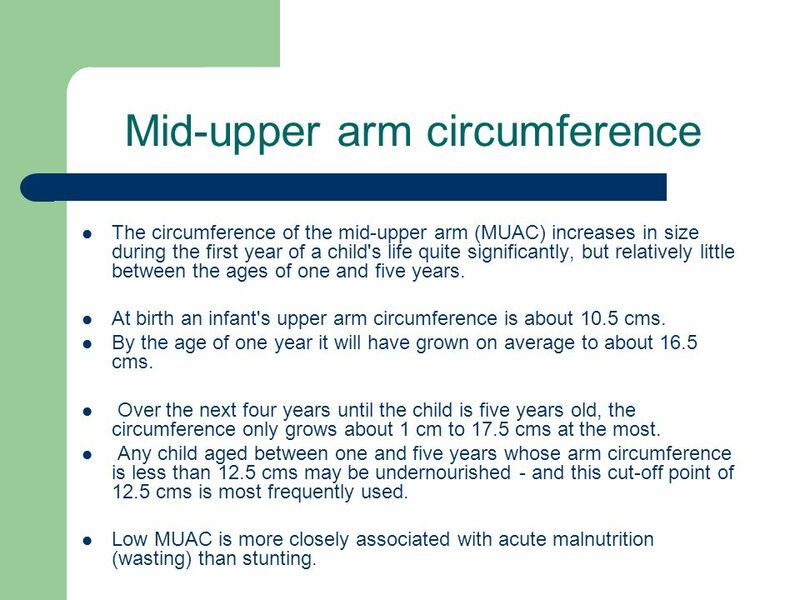 The circumference of the mid-upper arm (MUAC) increases in size during the first year of a child's life quite significantly, but relatively little between the ages of one and five years. At birth an infant's upper arm circumference is about 10.5 cms. By the age of one year it will have grown on average to about 16.5 cms. Over the next four years until the child is five years old, the circumference only grows about 1 cm to 17.5 cms at the most. Any child aged between one and five years whose arm circumference is less than 12.5 cms may be undernourished - and this cut-off point of 12.5 cms is most frequently used. 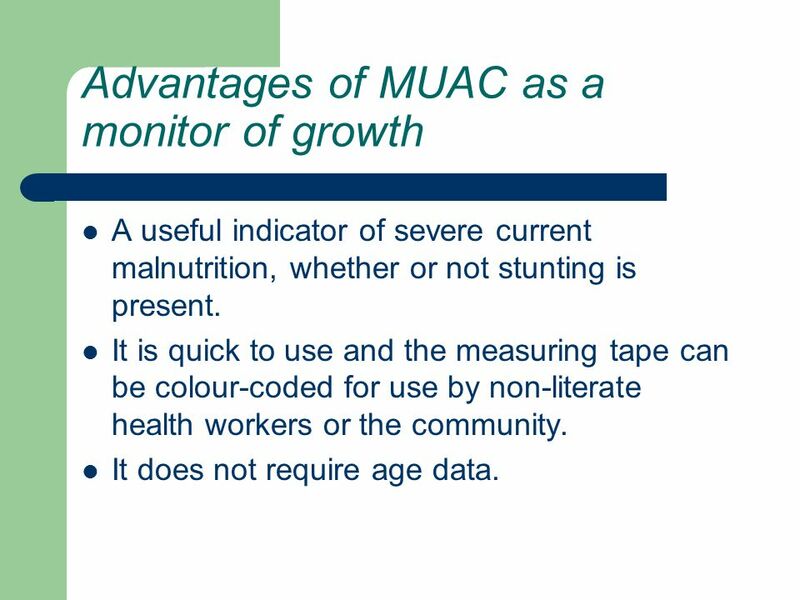 Low MUAC is more closely associated with acute malnutrition (wasting) than stunting. 32 Shakir Strip This Strip is often used in the communities. 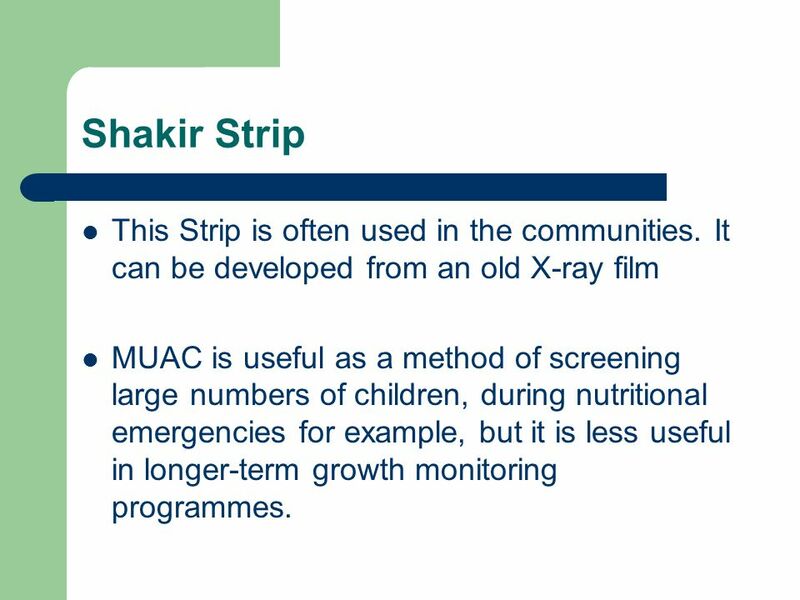 It can be developed from an old X-ray film MUAC is useful as a method of screening large numbers of children, during nutritional emergencies for example, but it is less useful in longer-term growth monitoring programmes. 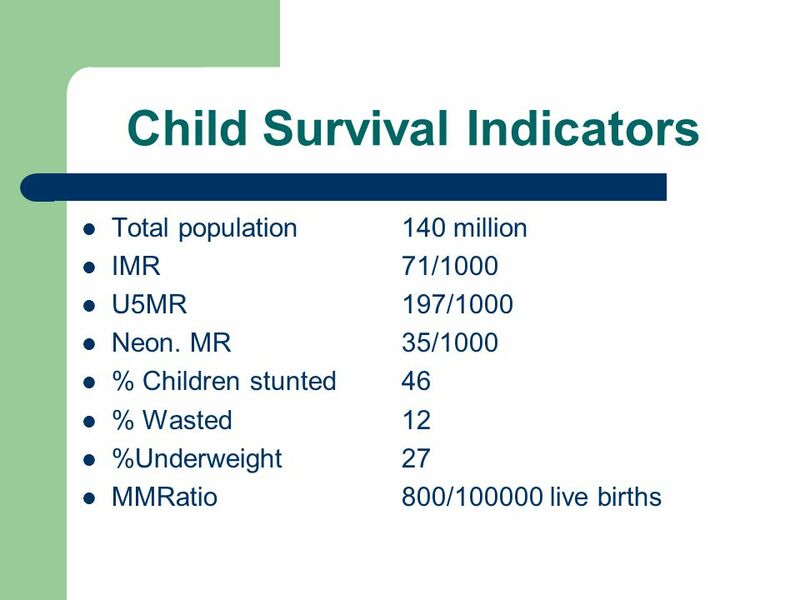 A useful indicator of severe current malnutrition, whether or not stunting is present. 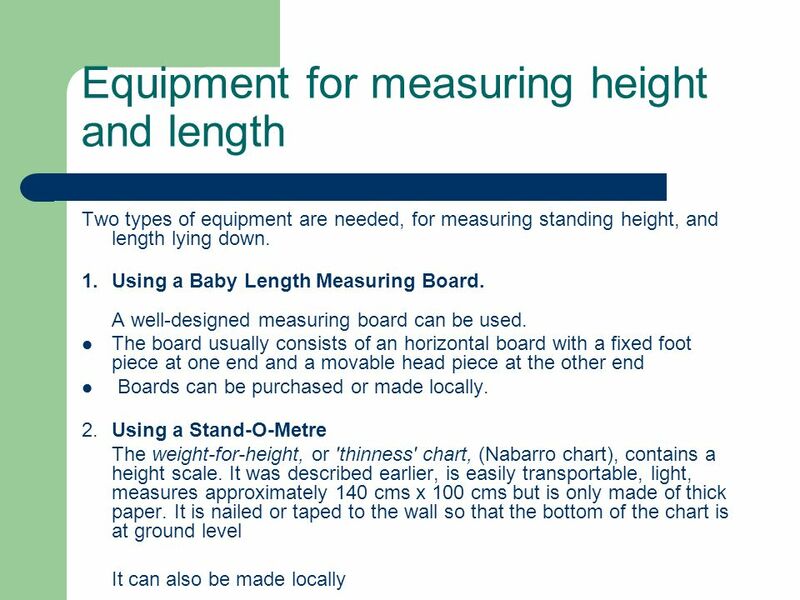 It is quick to use and the measuring tape can be colour-coded for use by non-literate health workers or the community. It does not require age data. 34 Advantages (Contd.) There are no known objections by communities to this measure. 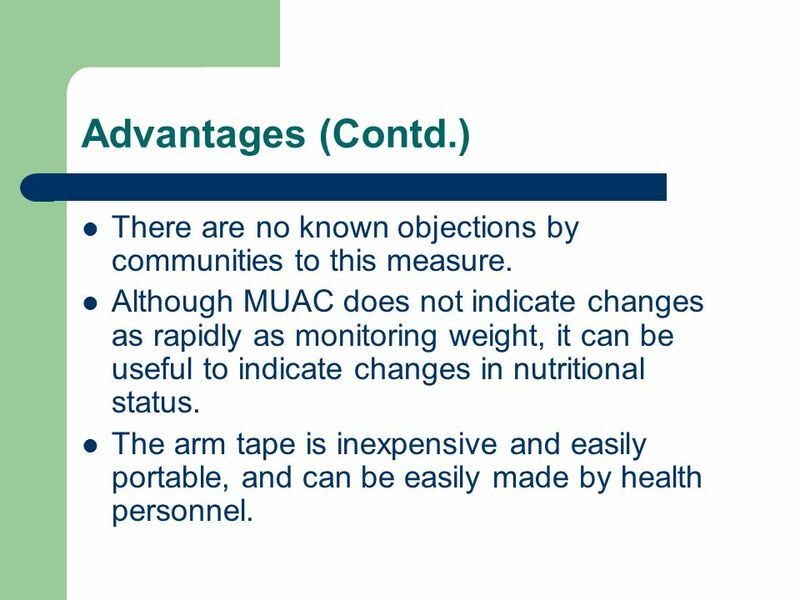 Although MUAC does not indicate changes as rapidly as monitoring weight, it can be useful to indicate changes in nutritional status. 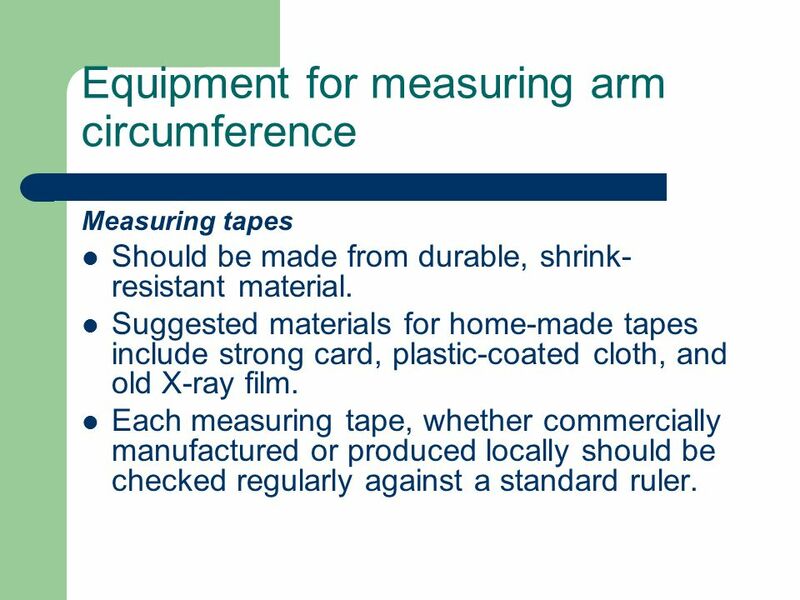 The arm tape is inexpensive and easily portable, and can be easily made by health personnel. 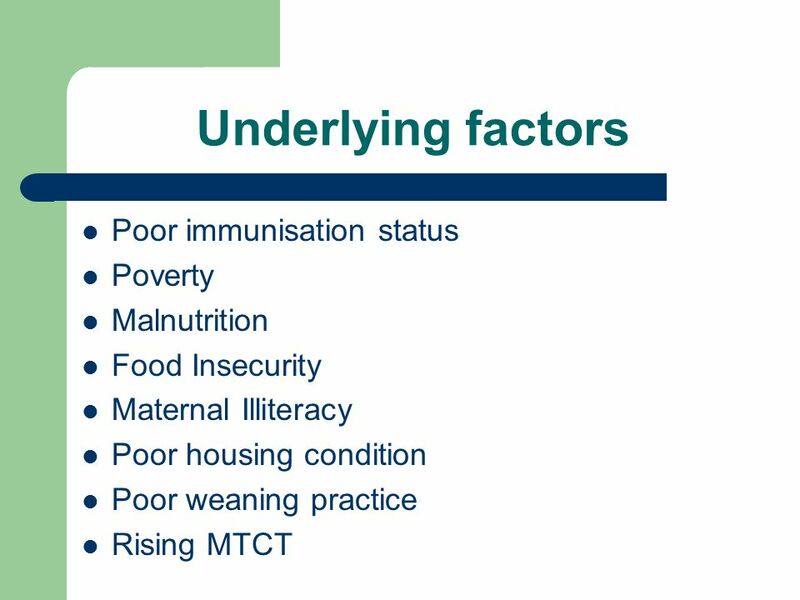 35 Disadvantages It only identifies children with severe malnutrition, and it is not a sensitive early predictor of malnutrition. There is a great variability in measurements. Finding the mid-point of the upper arm and placing the tape around the arm without compressing the flesh is not easy. 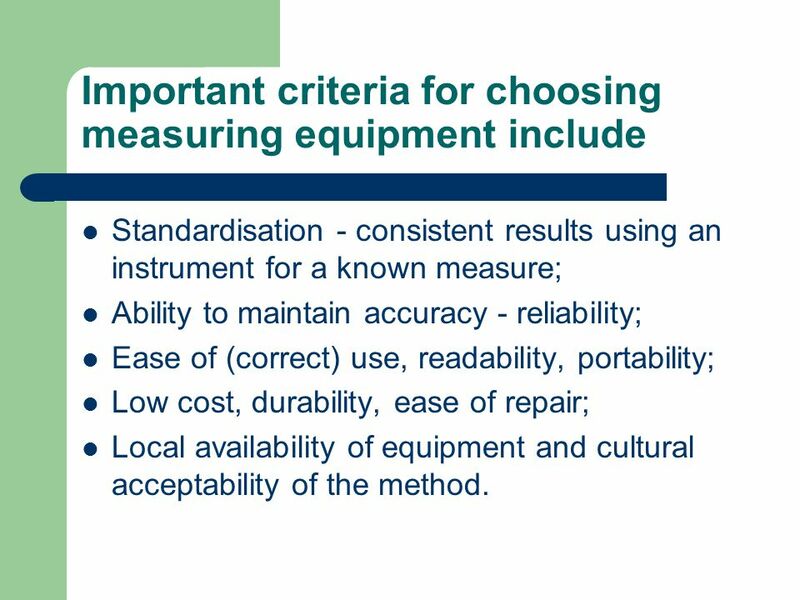 Standardisation - consistent results using an instrument for a known measure; Ability to maintain accuracy - reliability; Ease of (correct) use, readability, portability; Low cost, durability, ease of repair; Local availability of equipment and cultural acceptability of the method. 37 Weighing scales In choosing scales the following criteria should be considered: The accuracy of the scale to nearest 250 gms (preferably the nearest 100 gms or quarter of a pound, especially for young children). 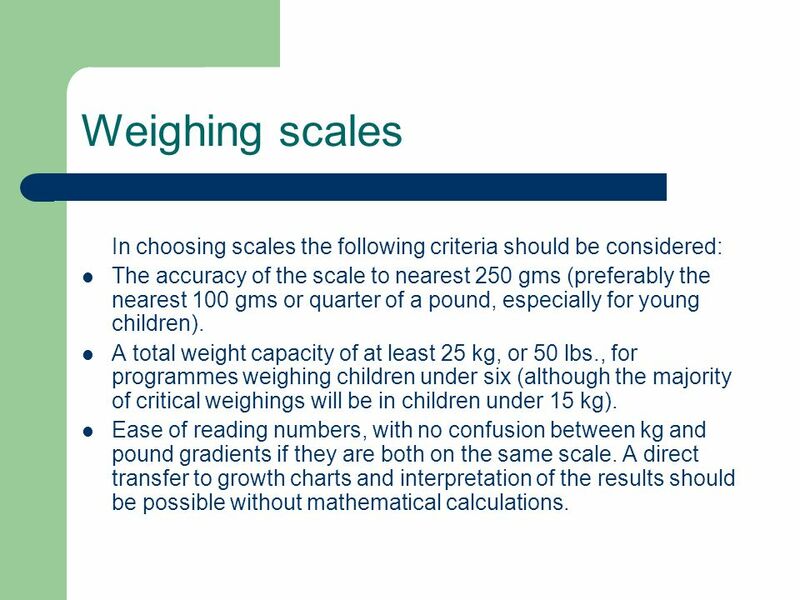 A total weight capacity of at least 25 kg, or 50 lbs., for programmes weighing children under six (although the majority of critical weighings will be in children under 15 kg). Ease of reading numbers, with no confusion between kg and pound gradients if they are both on the same scale. A direct transfer to growth charts and interpretation of the results should be possible without mathematical calculations. Does not lift the baby too high off the ground/floor. An adjusting mechanism which allows the scale to be tared (this means to adjust the needle to zero. If the needle rests on one side or other of zero the reading will be inaccurate. The reading point of the scale should be at eye level so that it can be read more accurately. When something like a basket to hold the child is hung on the scale this weight needs to be subtracted before the child is weighed. If the scale can be tared it is not necessary to subtract from the indicated weight). 1. Scales can be locally manufactured, 2. Commercially manufactured scales are available in a variety of forms. A)	Beam scales. Two types of single beam balance scales are used; both are easily maintained and remain accurate over time. 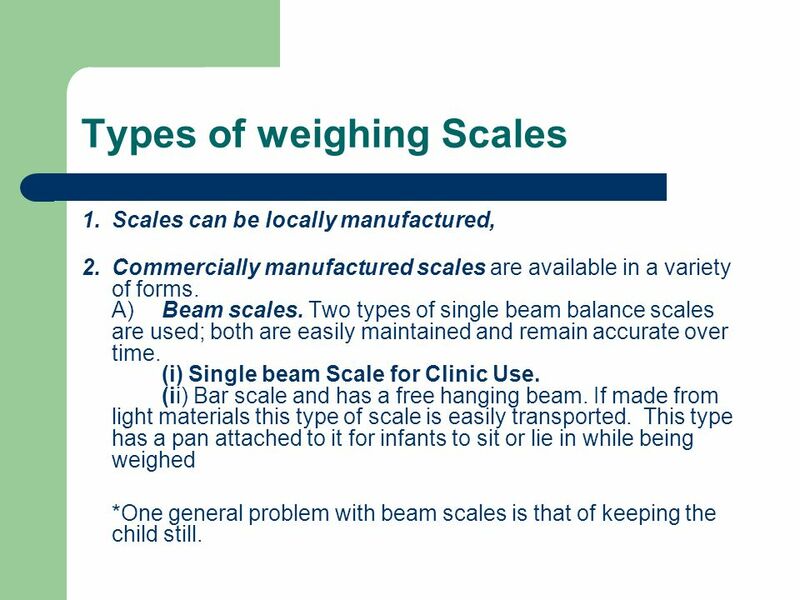 (i) Single beam Scale for Clinic Use. (ii) Bar scale and has a free hanging beam. If made from light materials this type of scale is easily transported. 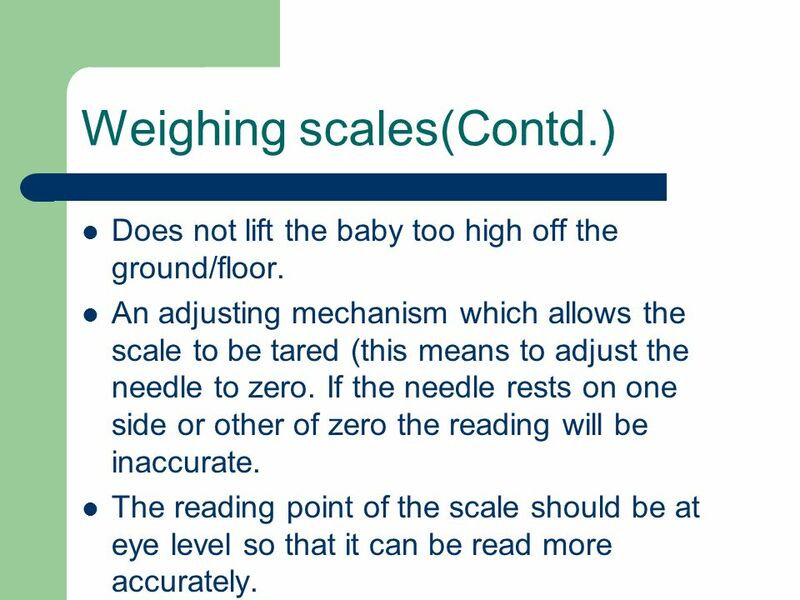 This type has a pan attached to it for infants to sit or lie in while being weighed *One general problem with beam scales is that of keeping the child still. but check accuracy by careful standardisation both during construction and during use. Primitive scales may also be more difficult to use. Advantages include: less expensive; health workers gain new understanding and skills, if they and the community make the scales; encourages self-reliance. * A design for a locally made weighing scale, currently being field-tested, is available from TALC. The scale requires a suitable spring and special weight charts, but, it is hoped, it will involve mothers more closely in monitoring their children's growth. 40 Spring hanging scales. B. These are usually spring scales which have either a dial-face or are tubular. i.) Dial-faced scales are light, easily transportable, durable, fairly accurate and easy to use. There have been problems with the internal parts of the scale rusting, and this type of scale is one of the most expensive of the dial models. 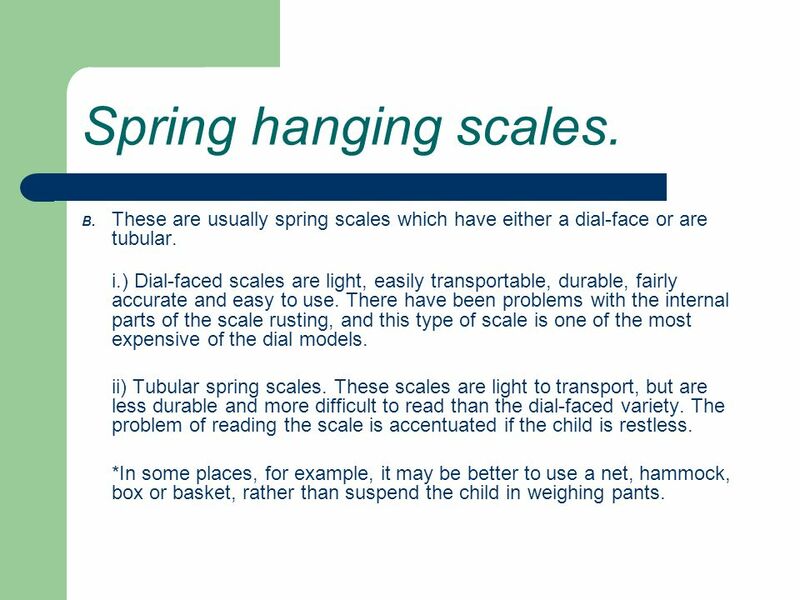 ii) Tubular spring scales. These scales are light to transport, but are less durable and more difficult to read than the dial-faced variety. The problem of reading the scale is accentuated if the child is restless. *In some places, for example, it may be better to use a net, hammock, box or basket, rather than suspend the child in weighing pants. 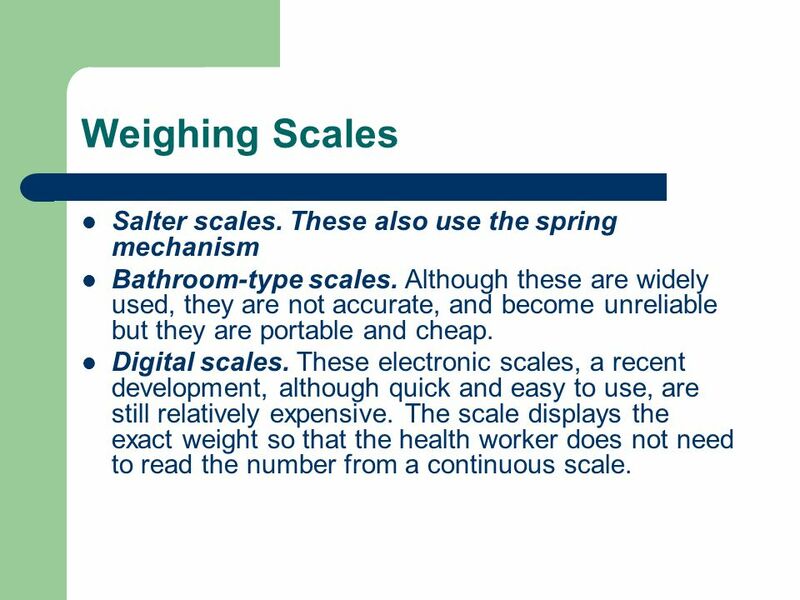 Bathroom-type scales. Although these are widely used, they are not accurate, and become unreliable but they are portable and cheap. Digital scales. These electronic scales, a recent development, although quick and easy to use, are still relatively expensive. The scale displays the exact weight so that the health worker does not need to read the number from a continuous scale. 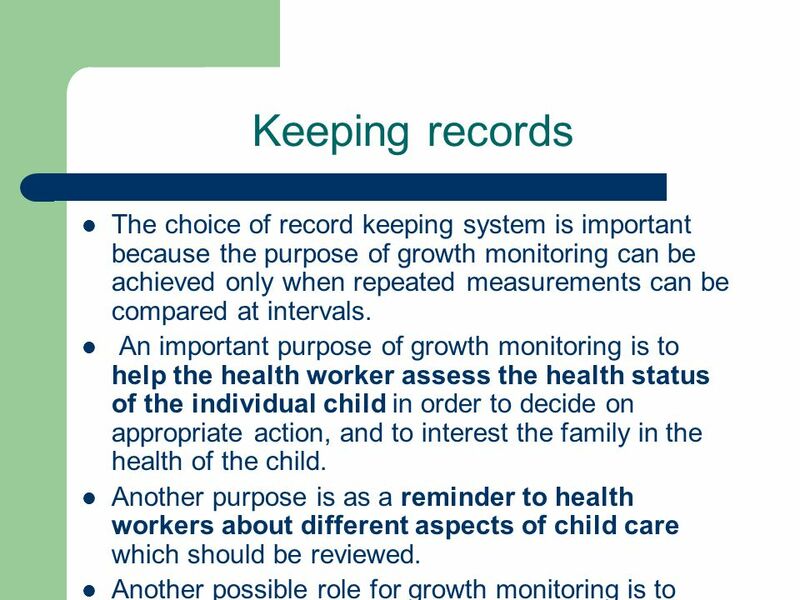 44 Keeping records The choice of record keeping system is important because the purpose of growth monitoring can be achieved only when repeated measurements can be compared at intervals. 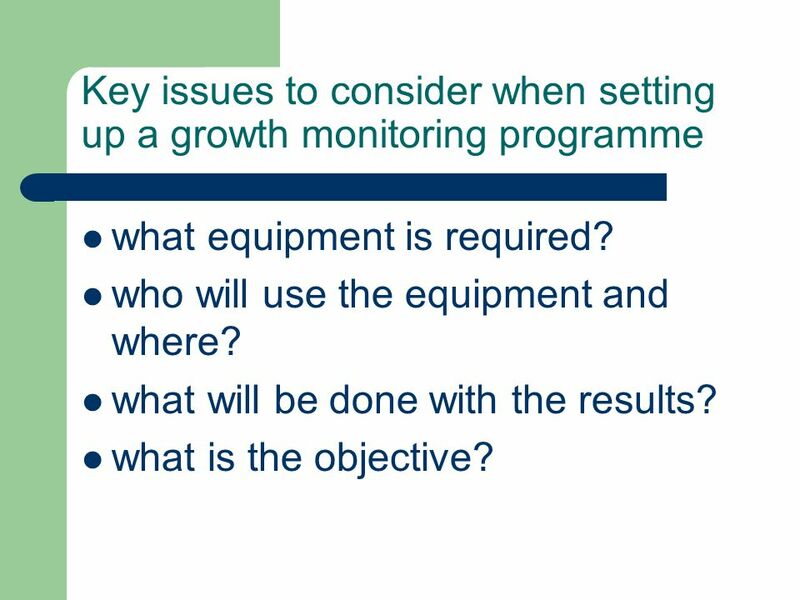 An important purpose of growth monitoring is to help the health worker assess the health status of the individual child in order to decide on appropriate action, and to interest the family in the health of the child. Another purpose is as a reminder to health workers about different aspects of child care which should be reviewed. Another possible role for growth monitoring is to motivate and educate families. This is more useful than comparison with a reference population. The most useful type of record-keeping system is that which requires the least mathematical calculation by the health worker or mother and which shows whether the child is growing at an acceptable rate. 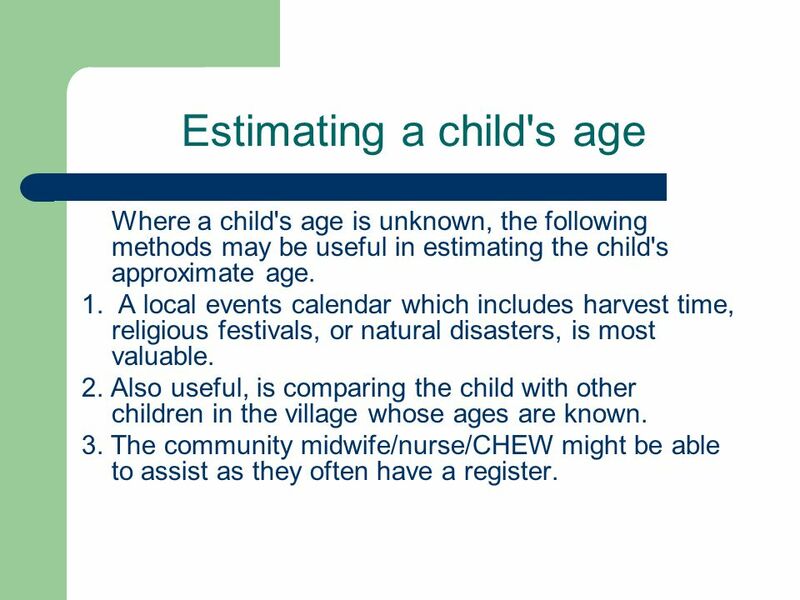 Where a child's age is unknown, the following methods may be useful in estimating the child's approximate age. 1. A local events calendar which includes harvest time, religious festivals, or natural disasters, is most valuable. 2. Also useful, is comparing the child with other children in the village whose ages are known. 3. The community midwife/nurse/CHEW might be able to assist as they often have a register. 4. 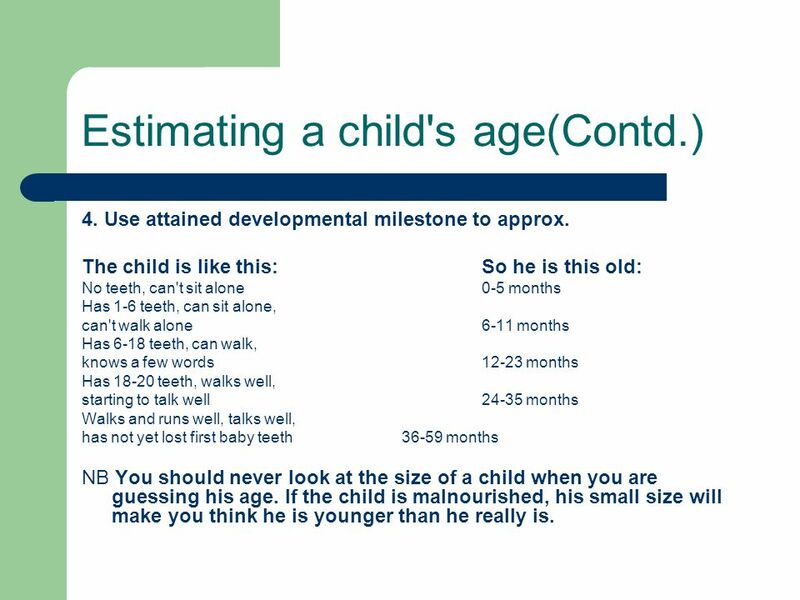 Use attained developmental milestone to approx. The child is like this:	So he is this old: No teeth, can't sit alone months Has 1-6 teeth, can sit alone, can't walk alone months Has 6-18 teeth, can walk, knows a few words months Has teeth, walks well, starting to talk well months Walks and runs well, talks well, has not yet lost first baby teeth months NB You should never look at the size of a child when you are guessing his age. If the child is malnourished, his small size will make you think he is younger than he really is. 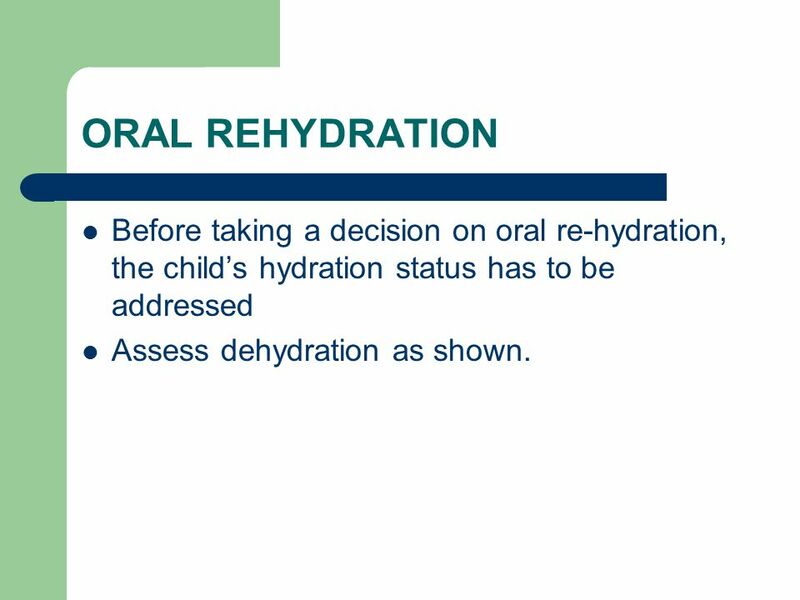 48 ORAL REHYDRATION Before taking a decision on oral re-hydration, the child’s hydration status has to be addressed Assess dehydration as shown. 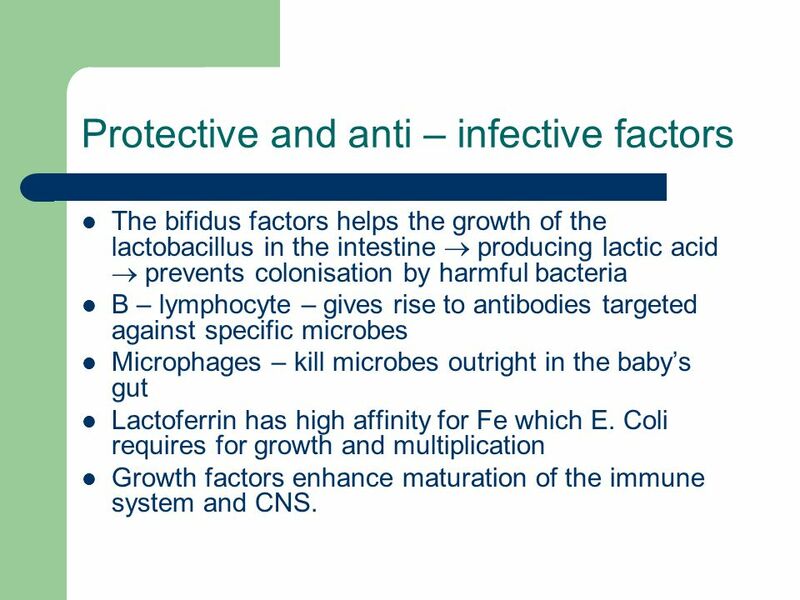 The bifidus factors helps the growth of the lactobacillus in the intestine  producing lactic acid  prevents colonisation by harmful bacteria B – lymphocyte – gives rise to antibodies targeted against specific microbes Microphages – kill microbes outright in the baby’s gut Lactoferrin has high affinity for Fe which E. Coli requires for growth and multiplication Growth factors enhance maturation of the immune system and CNS. 51 Mode of Protection of Anti – Infectious Substances. 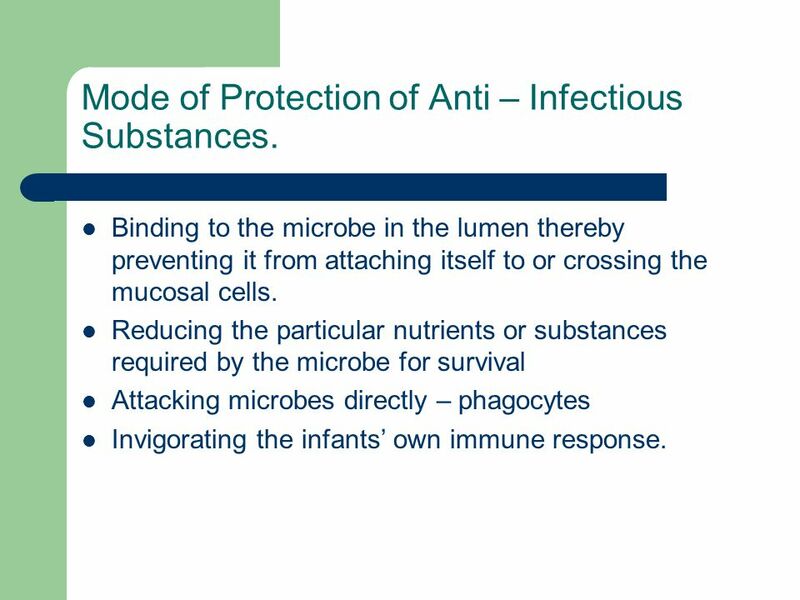 Binding to the microbe in the lumen thereby preventing it from attaching itself to or crossing the mucosal cells. Reducing the particular nutrients or substances required by the microbe for survival Attacking microbes directly – phagocytes Invigorating the infants’ own immune response. 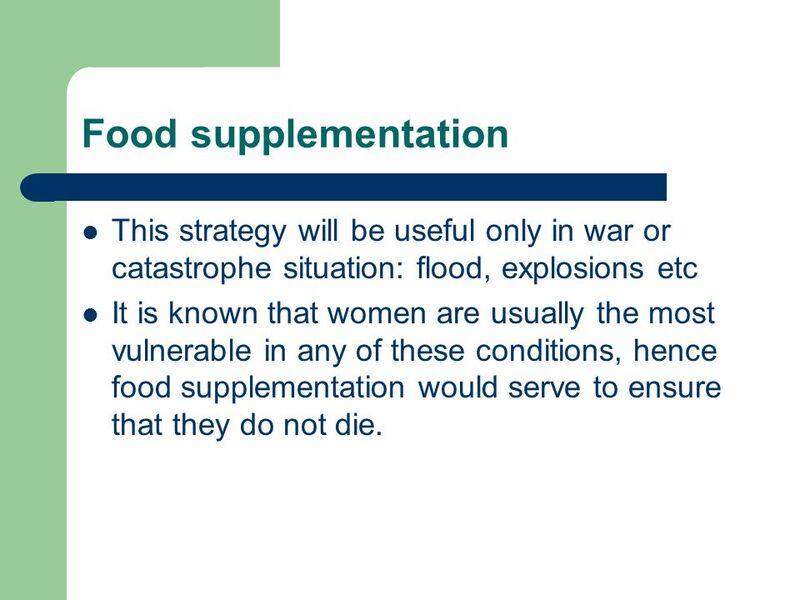 57 Food supplementation This strategy will be useful only in war or catastrophe situation: flood, explosions etc It is known that women are usually the most vulnerable in any of these conditions, hence food supplementation would serve to ensure that they do not die. 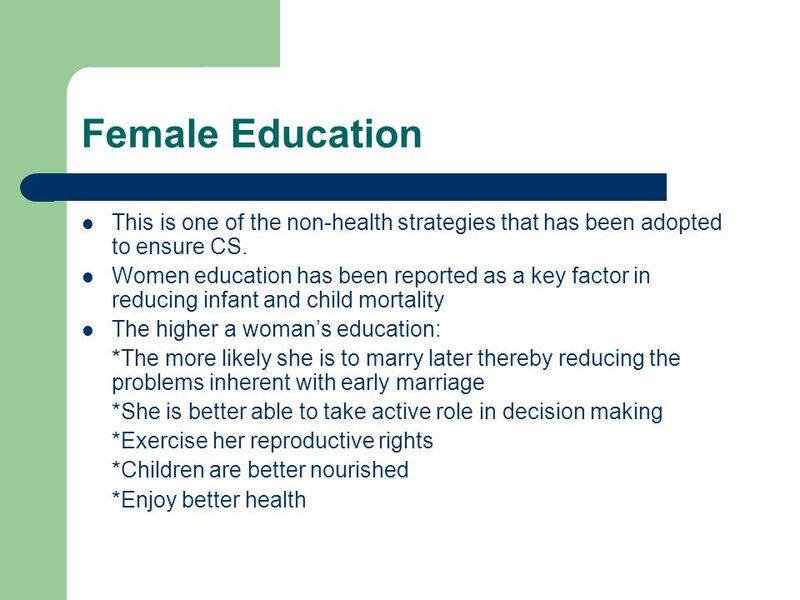 58 Female Education This is one of the non-health strategies that has been adopted to ensure CS. Women education has been reported as a key factor in reducing infant and child mortality The higher a woman’s education: *The more likely she is to marry later thereby reducing the problems inherent with early marriage *She is better able to take active role in decision making *Exercise her reproductive rights *Children are better nourished *Enjoy better health 1999 NDHS * MICS reveal that U%MR is twice as high in the North than the south. So also is the care-seeking etc. It has been known for years that vitamin A deficiency damages the eye, but it has only recently been shown that it is also linked with deaths from diarrhoea. 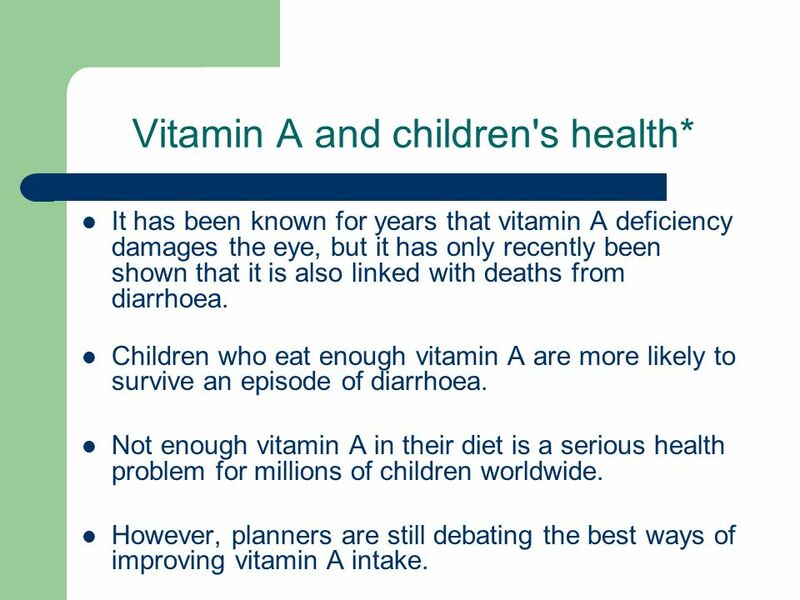 Children who eat enough vitamin A are more likely to survive an episode of diarrhoea. Not enough vitamin A in their diet is a serious health problem for millions of children worldwide. However, planners are still debating the best ways of improving vitamin A intake. 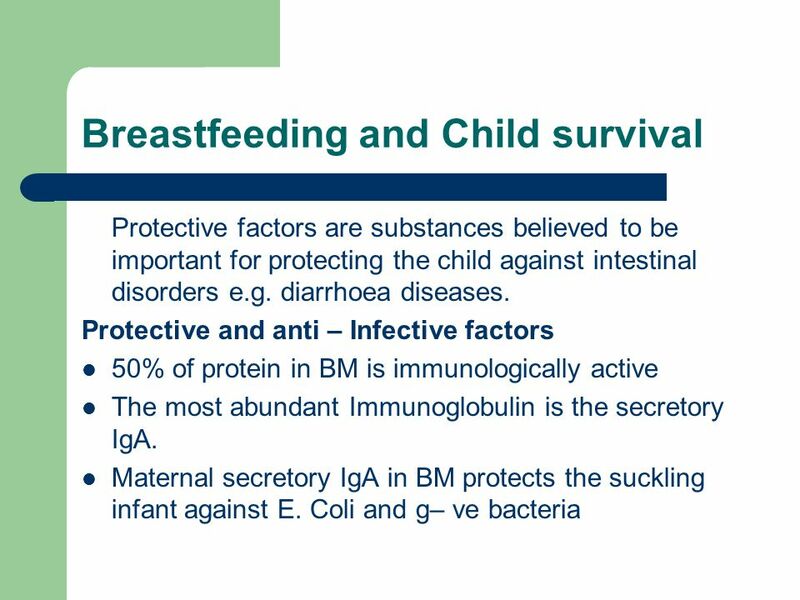 In the last ten years, a number of studies have looked at the role of vitamin A in increasing children's resistance to infection, and in helping them to recover from illnesses such as diarrhoea, measles and acute respiratory-infections. 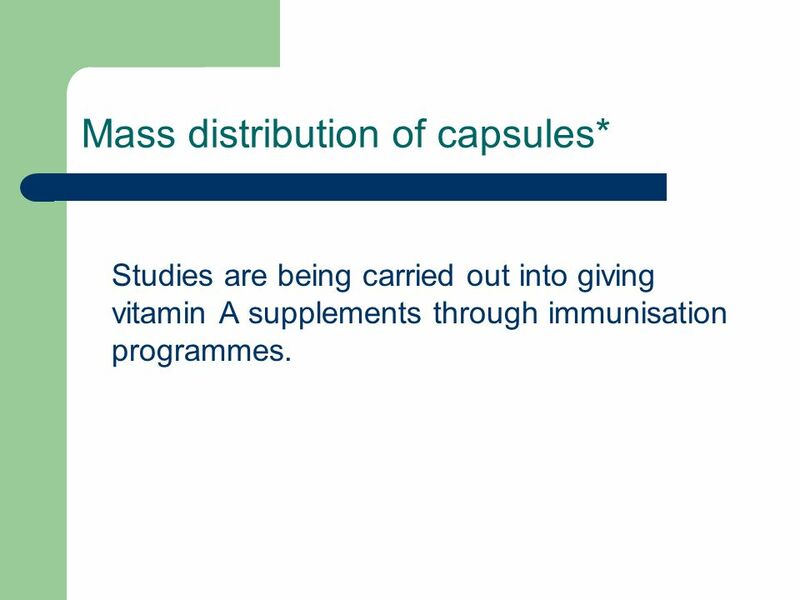 These studies have looked at the effect of providing vitamin A supplements to children in populations where there is vitamin A deficiency. 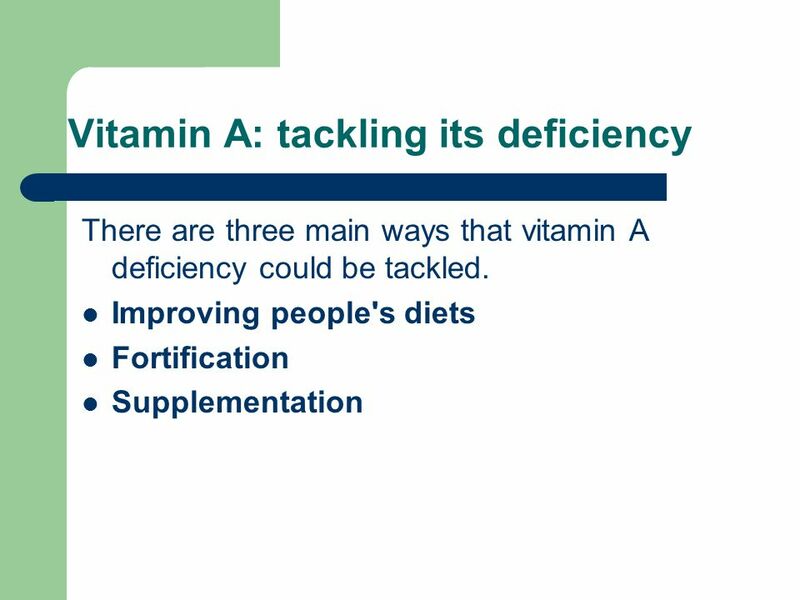 60 Vitamin A There is now clear evidence that vitamin A supplementation reduces mortality in populations where vitamin A deficiency is a public health problem. 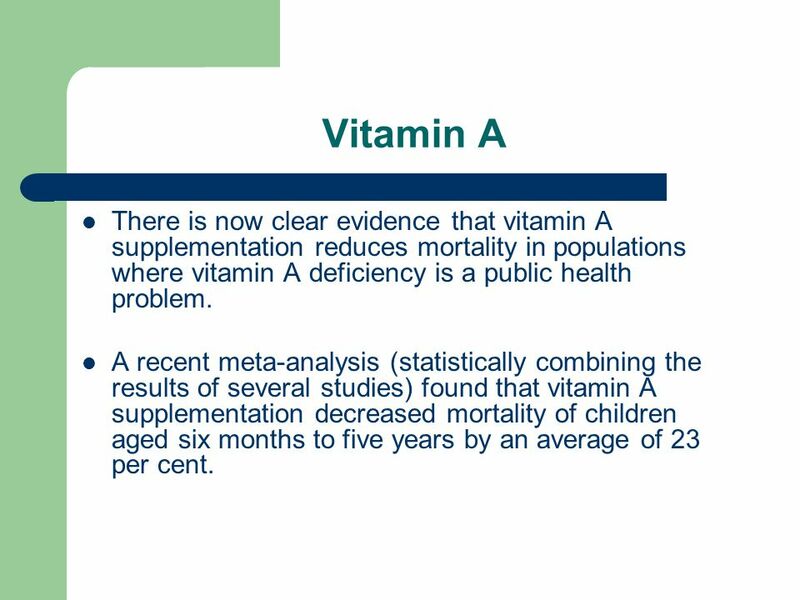 A recent meta-analysis (statistically combining the results of several studies) found that vitamin A supplementation decreased mortality of children aged six months to five years by an average of 23 per cent. 61 Vitamin A (Contd.) 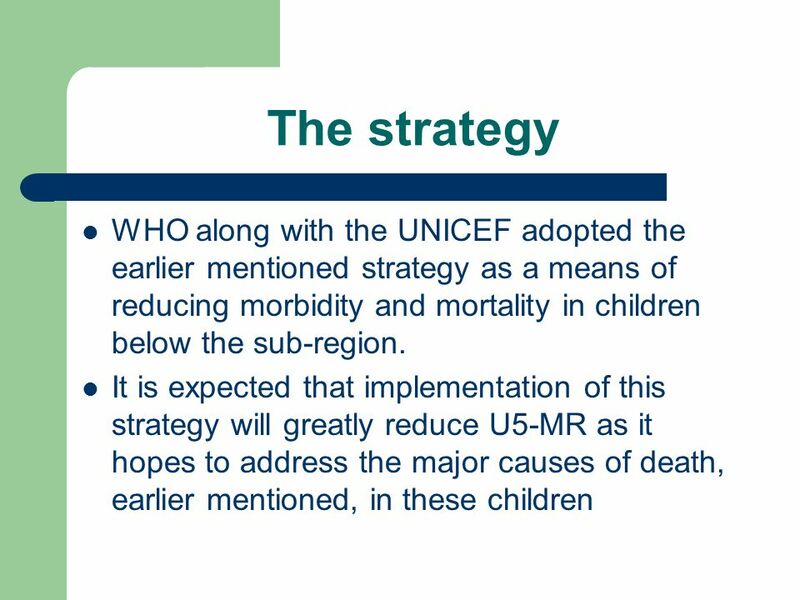 Most of the reduction in mortality came from a decrease in deaths due to diarrhoeal diseases and measles. 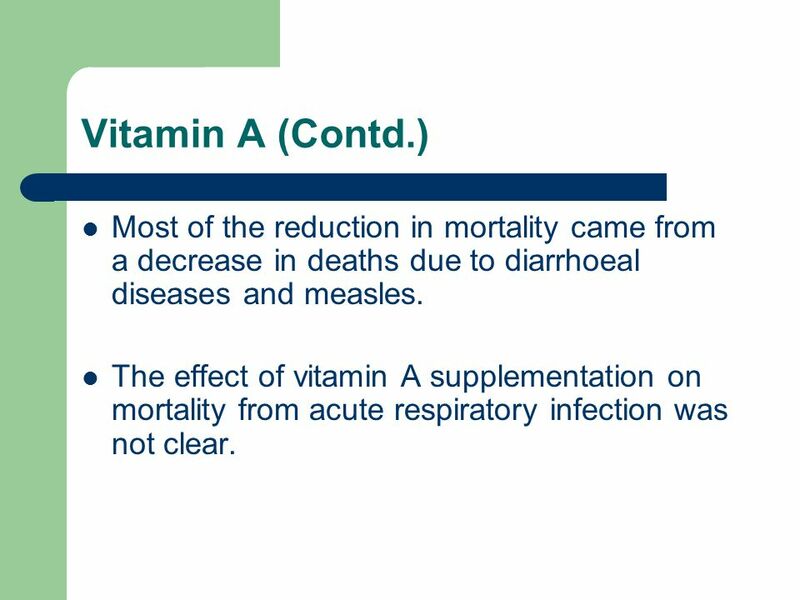 The effect of vitamin A supplementation on mortality from acute respiratory infection was not clear. 62 Vitamin A Vitamin A supplementation did not reduce the incidence or duration of diarrhoea or respiratory infections. 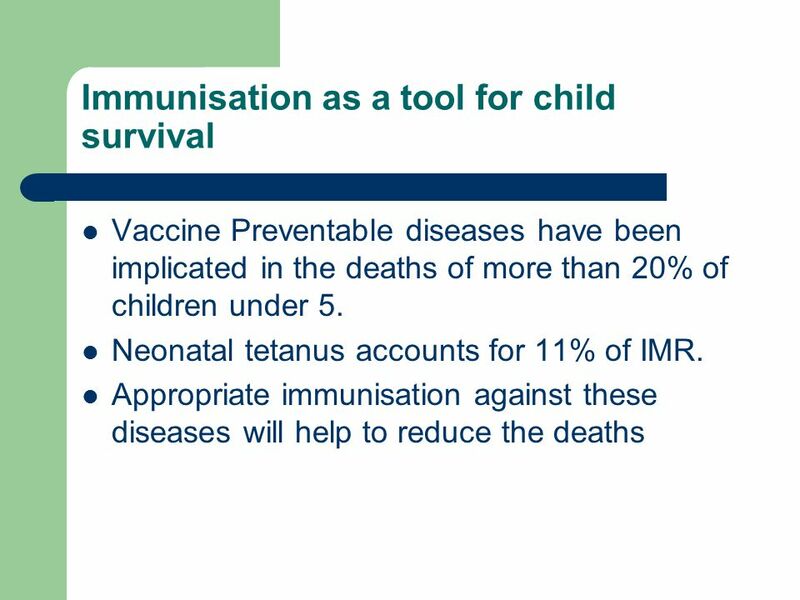 But it did appear to reduce the severity of diarrhoea and measles. 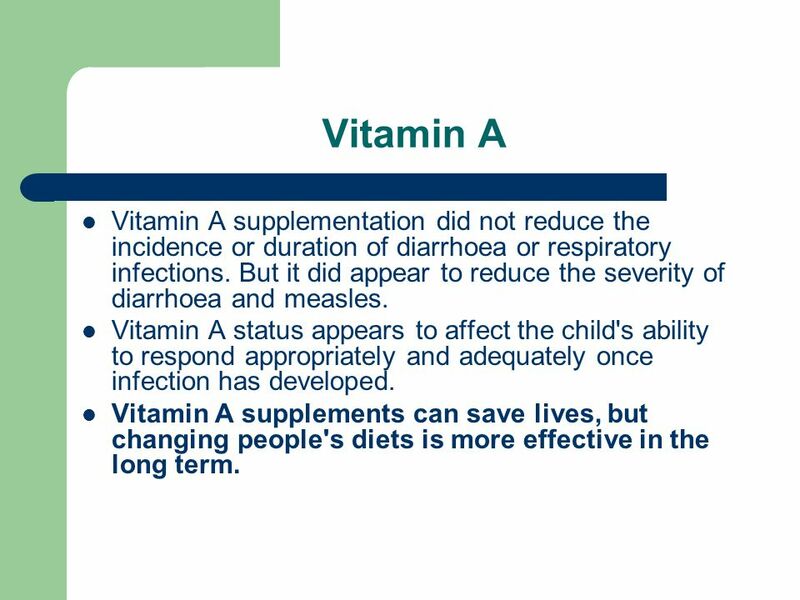 Vitamin A status appears to affect the child's ability to respond appropriately and adequately once infection has developed. Vitamin A supplements can save lives, but changing people's diets is more effective in the long term. 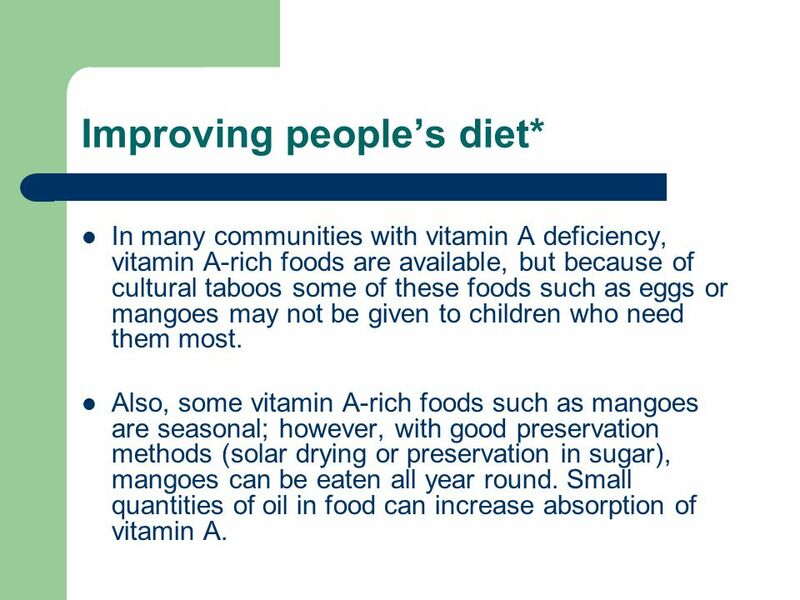 In many communities with vitamin A deficiency, vitamin A-rich foods are available, but because of cultural taboos some of these foods such as eggs or mangoes may not be given to children who need them most. Also, some vitamin A-rich foods such as mangoes are seasonal; however, with good preservation methods (solar drying or preservation in sugar), mangoes can be eaten all year round. Small quantities of oil in food can increase absorption of vitamin A. 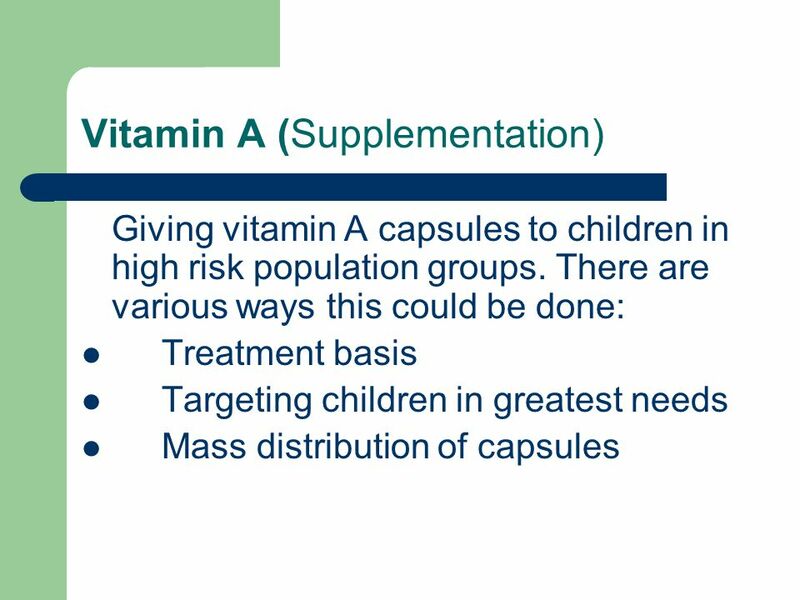 1…With the right advice and encouragement most families can improve their children's vitamin A intake without relying on outside interventions. 2…. 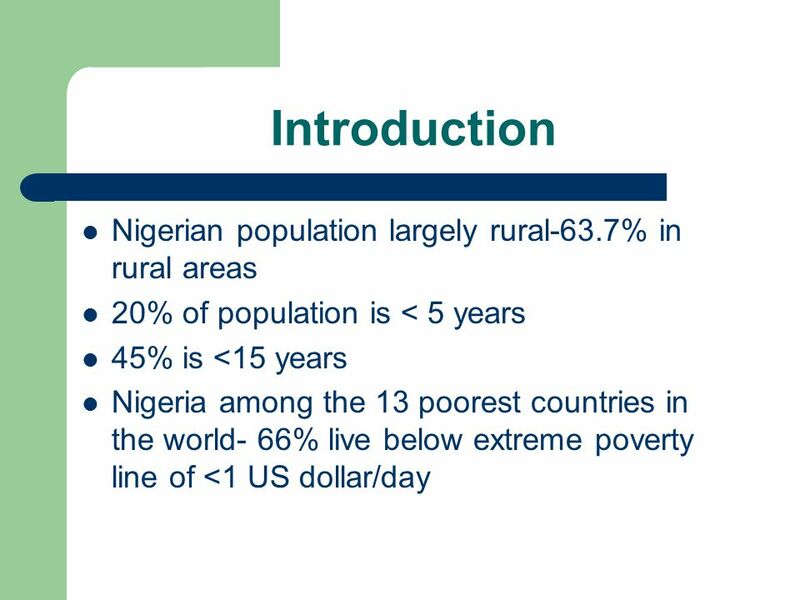 Education and information campaigns, involving community members, mothers, nutritionists, farmers, teachers and health workers, are needed. 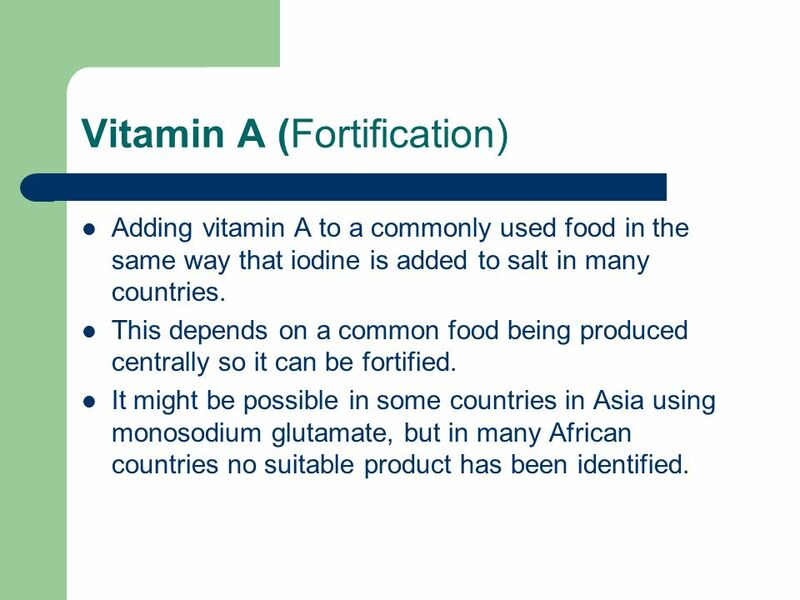 Adding vitamin A to a commonly used food in the same way that iodine is added to salt in many countries. This depends on a common food being produced centrally so it can be fortified. It might be possible in some countries in Asia using monosodium glutamate, but in many African countries no suitable product has been identified. 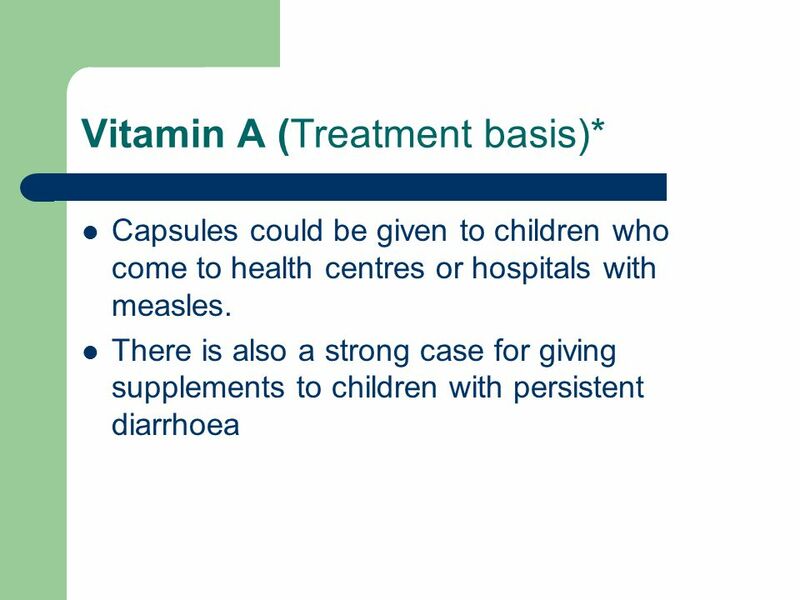 Capsules could be given to children who come to health centres or hospitals with measles. 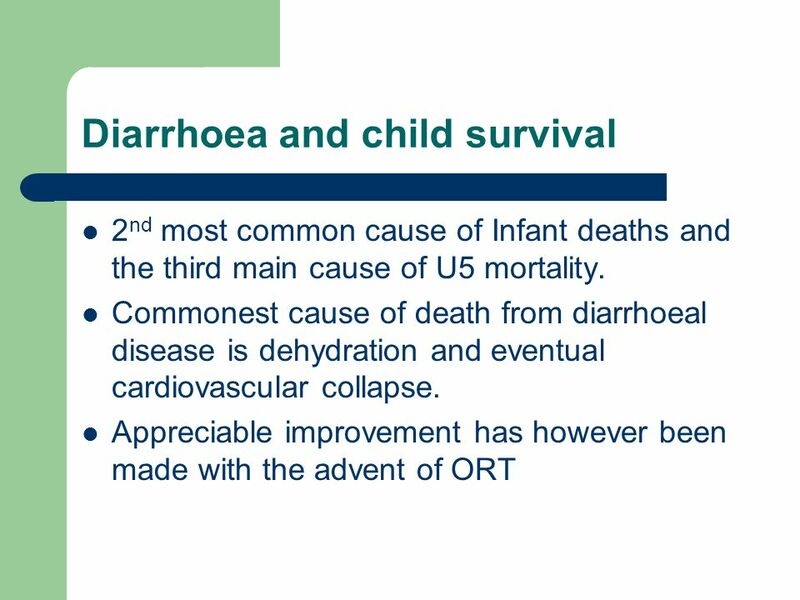 There is also a strong case for giving supplements to children with persistent diarrhoea although this could involve a risk of too frequent dosing. This is more difficult. 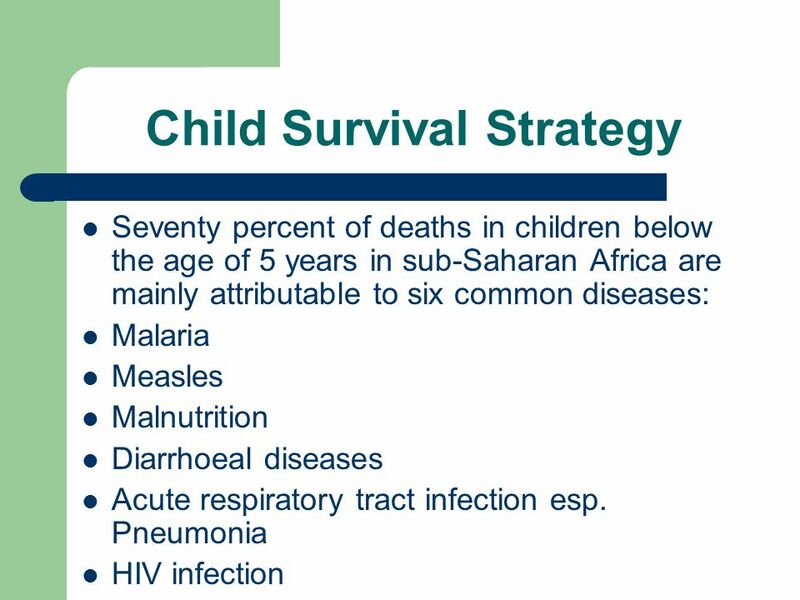 Needy children are often the hardest to reach, e. g. they are in remote areas or are not in contact with the health system. 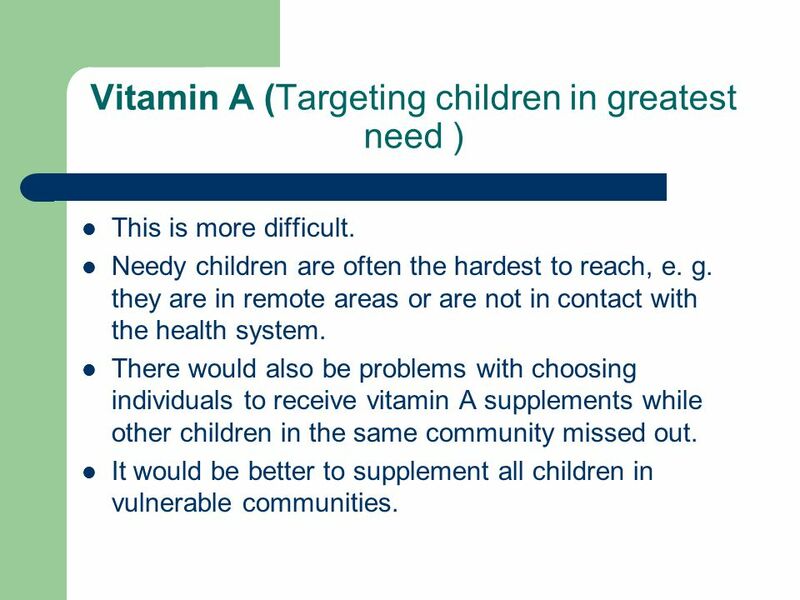 There would also be problems with choosing individuals to receive vitamin A supplements while other children in the same community missed out. 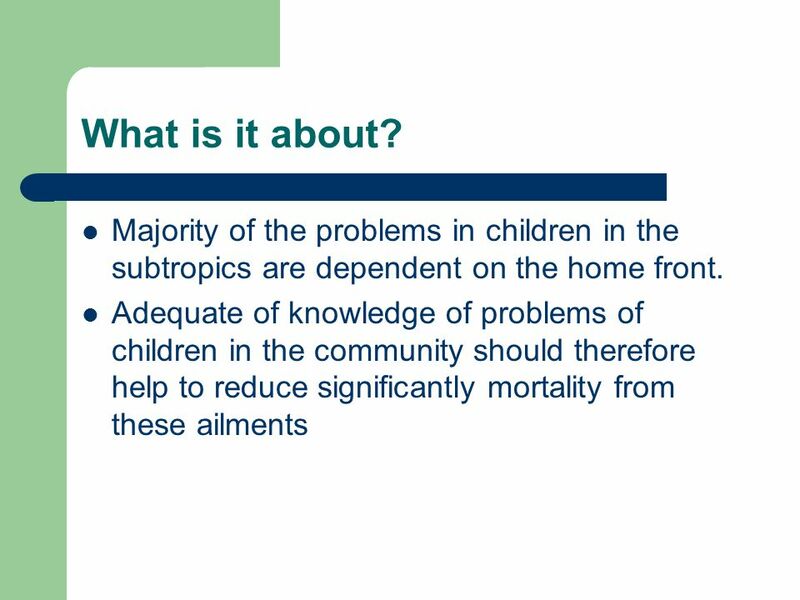 It would be better to supplement all children in vulnerable communities. 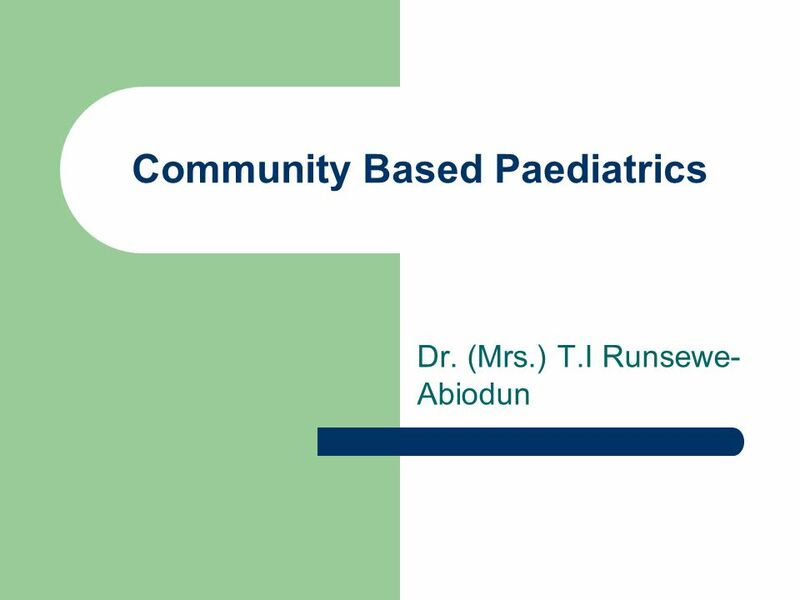 Download ppt "Community Based Paediatrics"
A class in radio for youngsters at Ida B. Wells Housing Project, 1942. 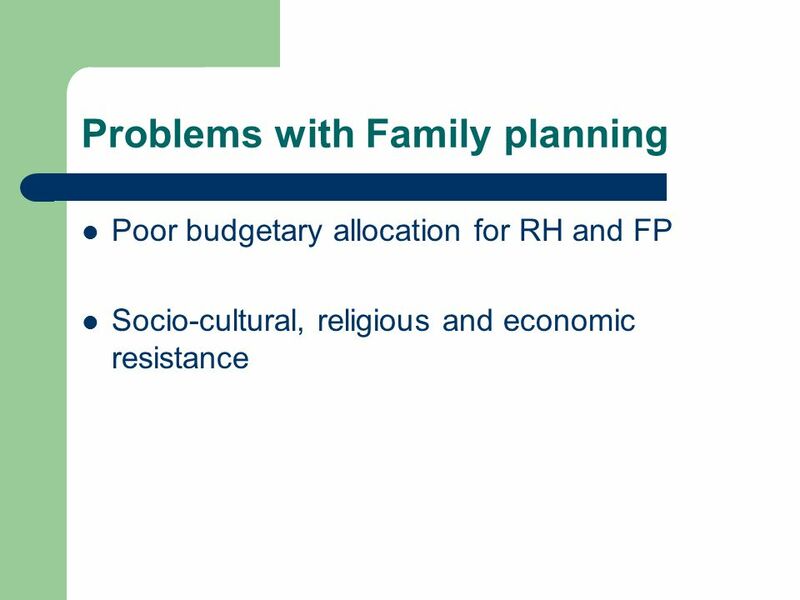 WOMEN AND CHILD HEALTH A REJIG OF POLICIES REQUIRED. 1 INTRODUCTION Price of a medicine has impact on affordability and therefore access to essential medicines. Sound data for price, availability and affordability. PROJECT: EARLY DETECTION OF CHILDREN WITH SPECIAL NEEDS AND THEIR DEVELOPMENTAL PROBLEMS author: LJUBO LEPIR, sociologist PEPUBLIKA SRPSKA PUBLIC CHILD. 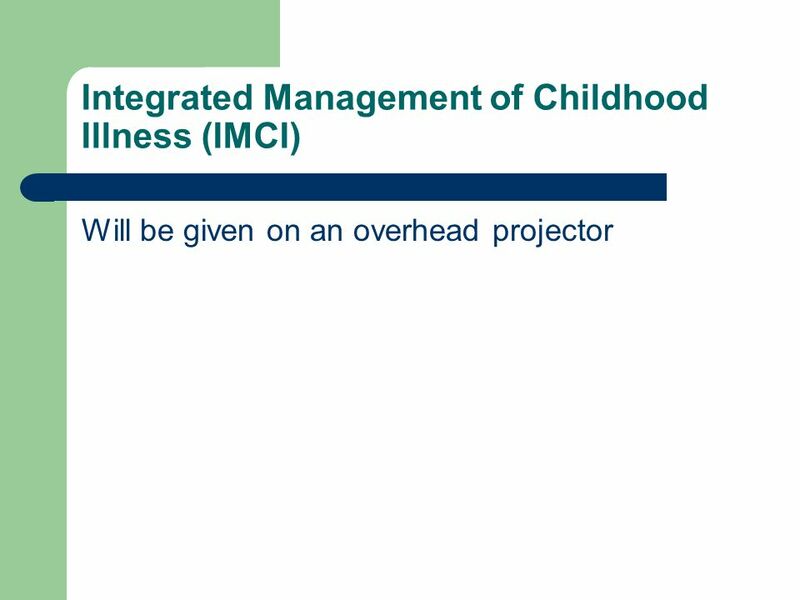 Ensuring integrated and inclusive Early Childhood Education and Care. Contribution of Survey to Health Systems Performance Monitoring: experience with the World Health Survey THE MALAYSIAN EXPERIENCE September 2006. Partnerships to Improve Your Medical Home Challenge - Providing children and families a comprehensive medical home with limited resources of all kinds. Logistics & Protocols: KEYS Survey Administration. Dr. Walter Obiero Clinical Manager Nyanza Reproductive Health Society. Mobile Technology Helps Community Health Workers Increase Access to Skilled Delivery and Provide Quality Counseling and Quick Referrals for Maternal and. Collaborating for the future TAFE Library Conference Dr Dahle Suggett 1 st July 2004 Dep. Secretary Office of Learning and Teaching DE&T. HEALTH INDICATORS IN ZAMBIA PRESENTER; DR PHIRI CHIMIKA 13 th march 2012. 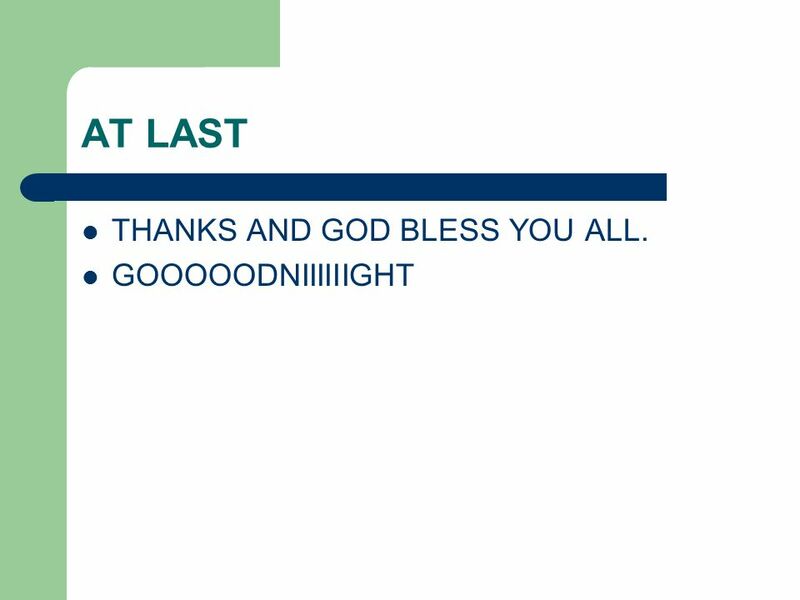 Introduction Task Process Evaluation Conclusion. What do you really know about your state? You are about to embark on a journey of discovery. Connect. Migration From Mexico to the USA. 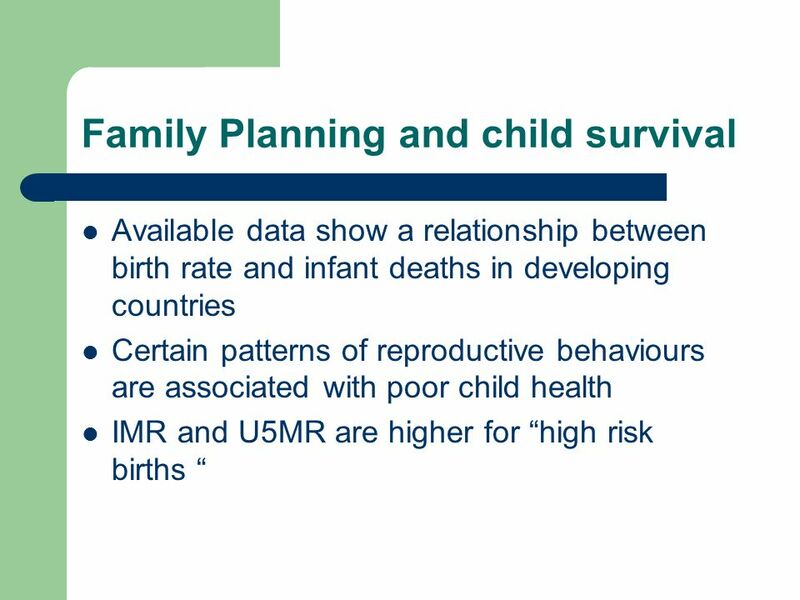 The USA is a MEDC (GNP per capita: $24,750, infant mortality: 8/1000). Mexico is a LEDC (GNP per capita: $3,750, infant.